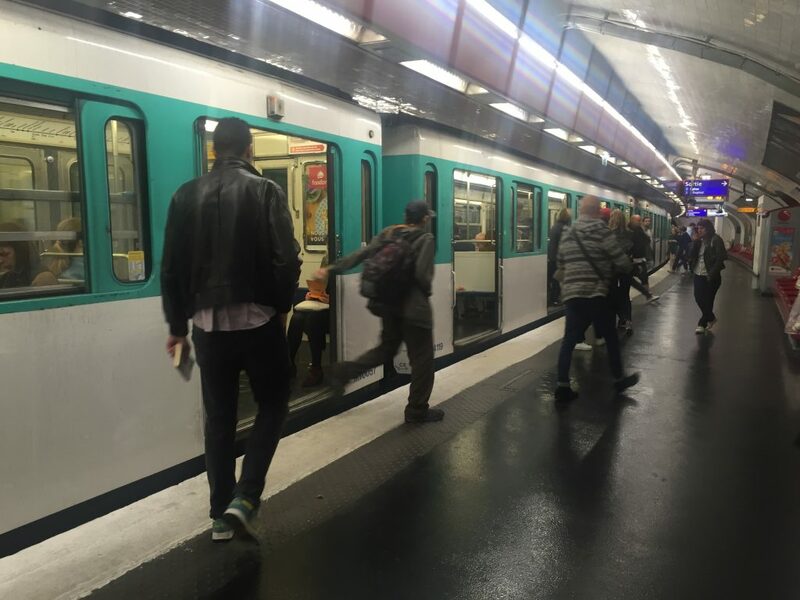 I love the Paris metro system. It is quick, safe and easy to navigate. An app for your phone makes it even easier to use. Put in where you are starting and where you want to go, and the app tells you which lines and stops to use and how long it will take. We use the Passe Navigo card which can be loaded with weekly or monthly unlimited rides. We saved our picture ID cards from our last visit and activated them at a machine at the metro stop closest to us. 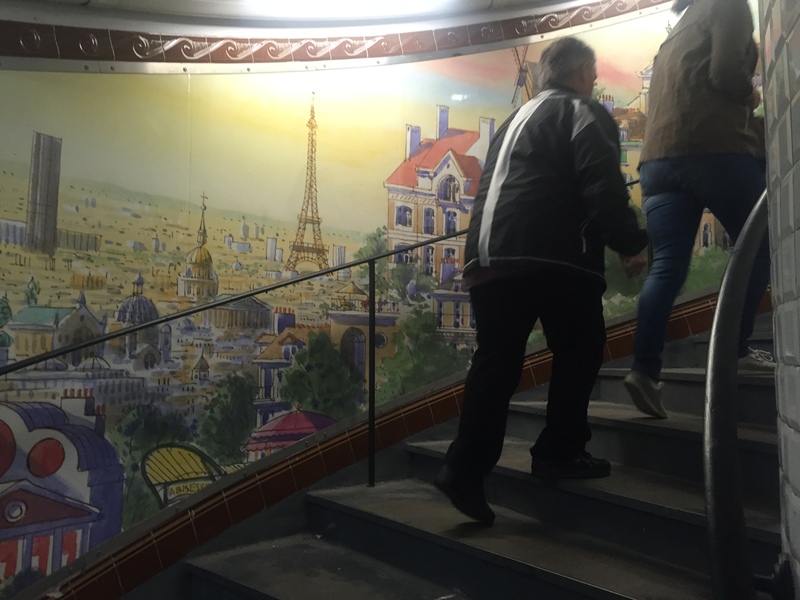 Most metro stops are quite ordinary, but the walls along the many steps at the Montmarte exit have different murals at each section. This stop may have more stairs to exit than any other metro stop, so it is nice to have the murals for distraction. 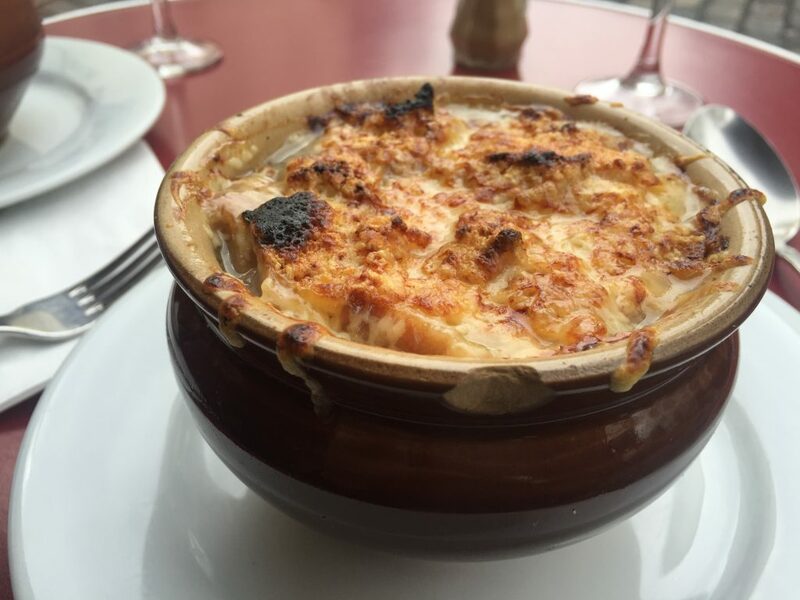 Three years ago we had soupe a l’oignon (it is onion soup, not French onion soup here, of course) at a little cafe in Montmarte that we loved so much we returned the following week to eat it again. 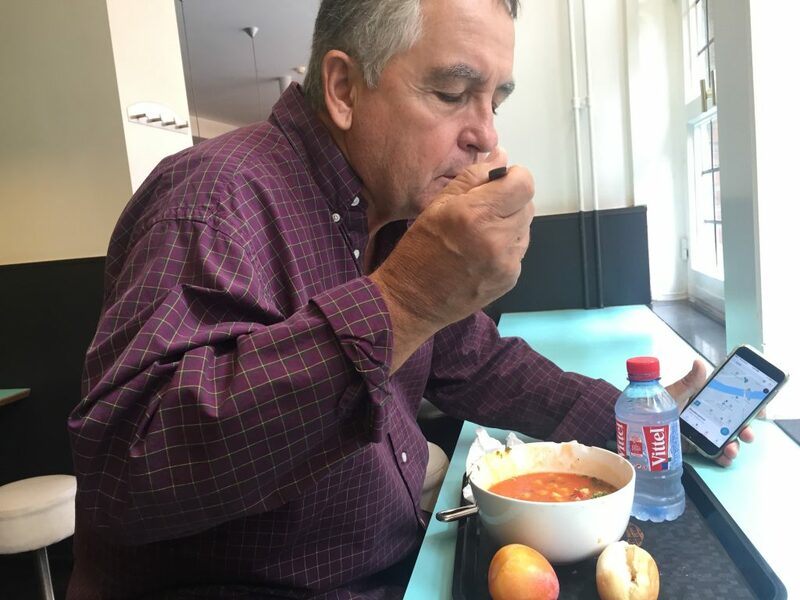 So, on this trip, one of our first lunches was a return visit to Le Consulate, 18 Rue Nouvins, for soupe a l’oignon. I worried that the reality would not live up to my three-year memory. Not to worry-sitting outside on the tiny, tilting patio,enjoying the tasty soup and a glass of wine was every bit as wonderful as I remembered. 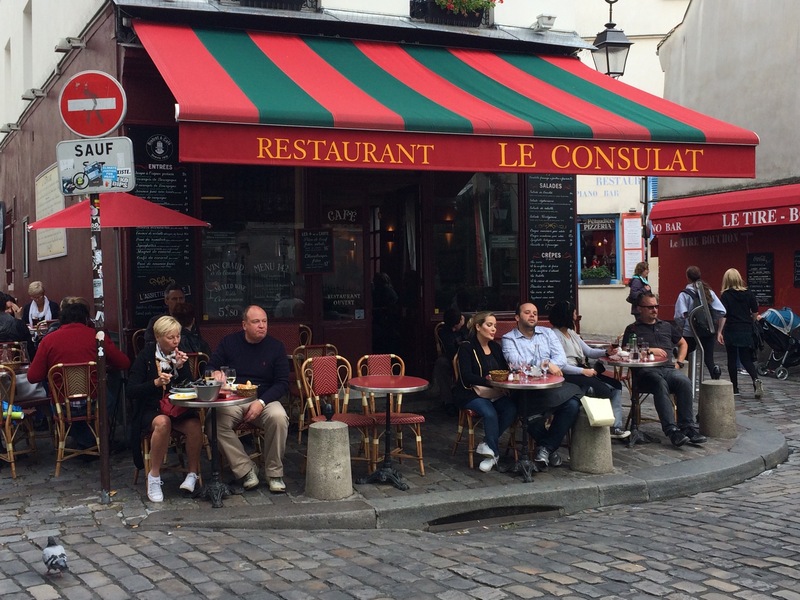 Our waiter told us he had been at this cafe three years ago, so we may even have had the same waiter. 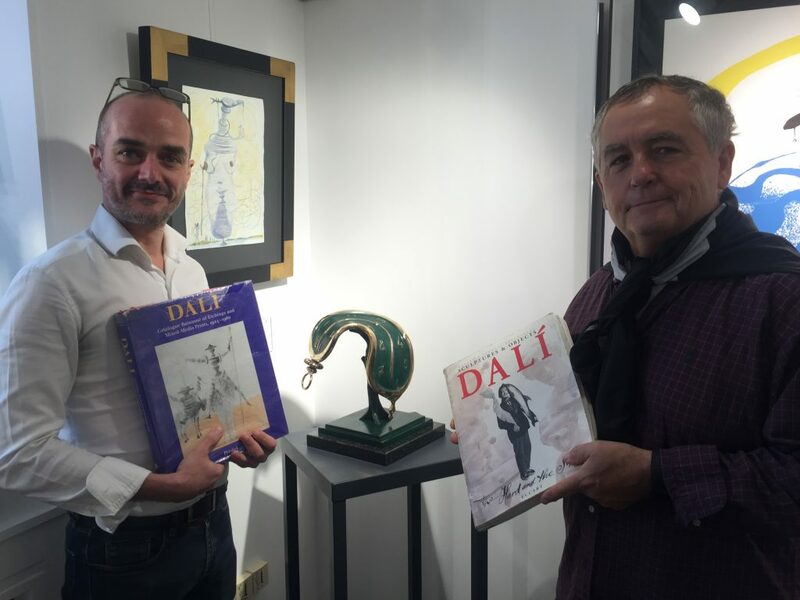 We had a wonderful time visiting the Galerie Montmartre and talking with gallery manager Bertrand Teneze. He gave us a great lesson on the different kinds of originals and prints and how they are catalogued. The gallery had many works by Dali, and it was fun to talk with him about the Dali museum in FL and the collaboration between Dali and Walt Disney. 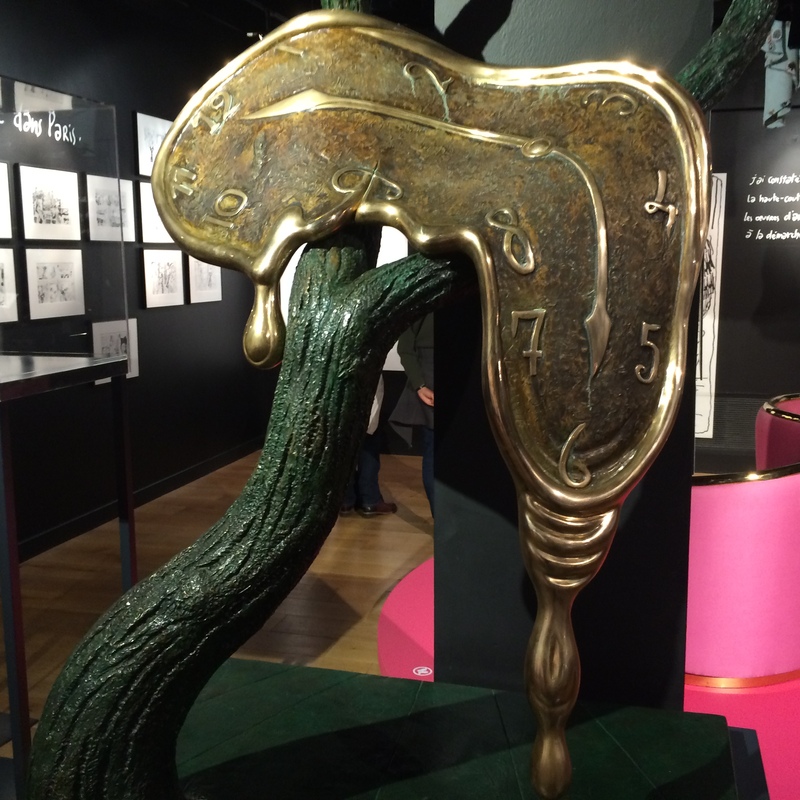 He told us that the Cheshire cat in Disney’s Alice in Wonderland was modeled on Dali. 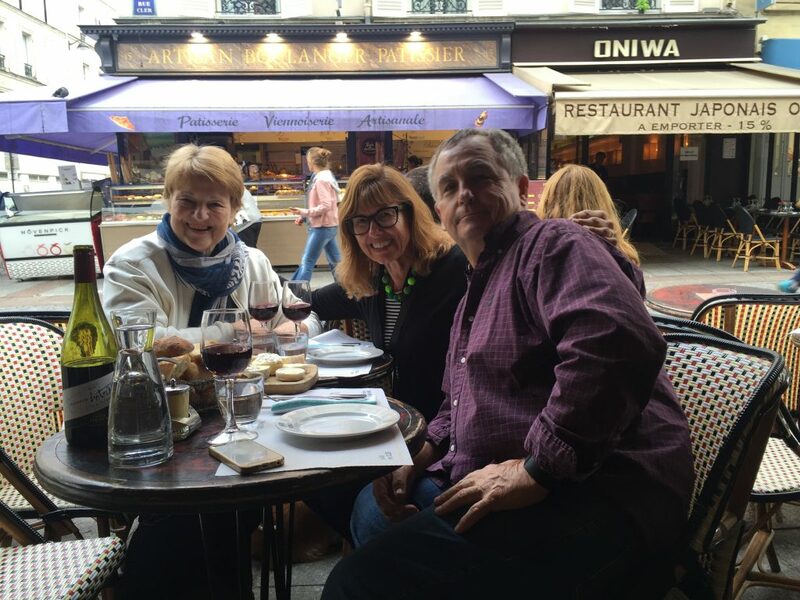 As we were talking with him about how much we love Paris, he told us he has lived in Paris twenty years and believes it takes a lifetime to know Paris. 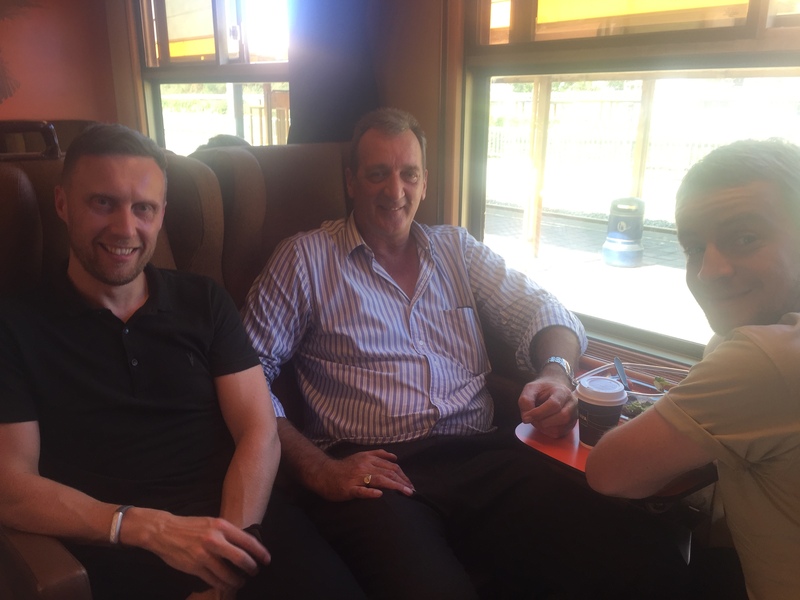 He even gave me a French pronunciation lesson-in the nicest way, of course. Just a short distance beyond the gallery is Espace Dali Paris, It is a small, lovely place devoted to the sculptures and engravings of Salvador Dali. The sculptures were amazing, and it was not crowded at all. 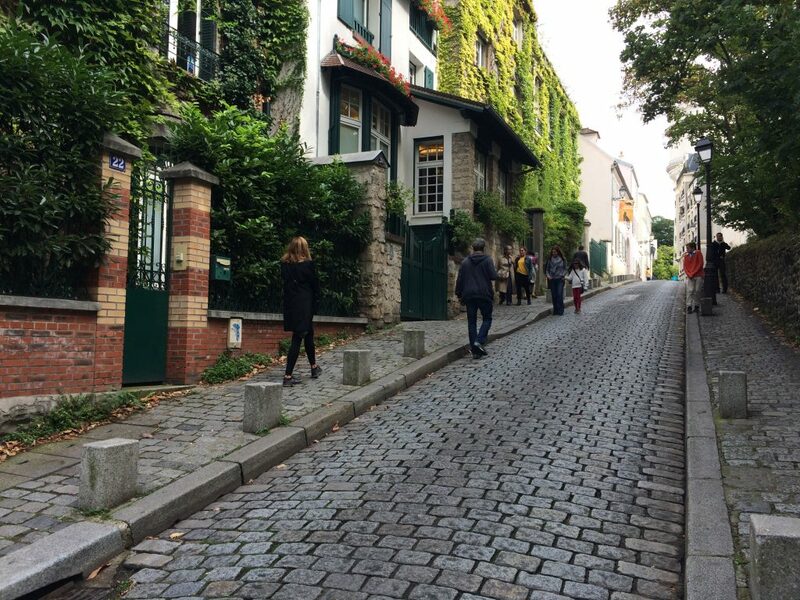 Before leaving, we spent a little time walking the lovely Montmartre streets. 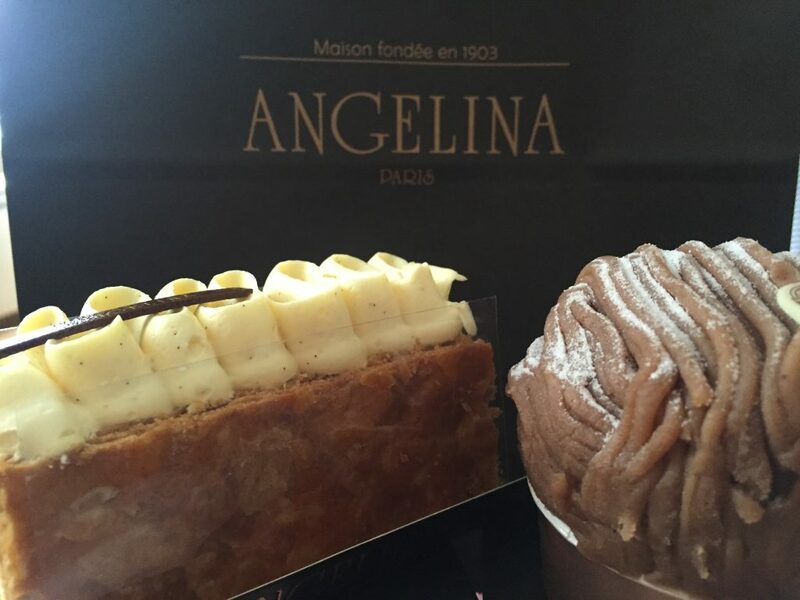 On our way home we stopped at Angelina’s again for a little pastry to bring home. Only in Paris do your pastries come gift wrapped. 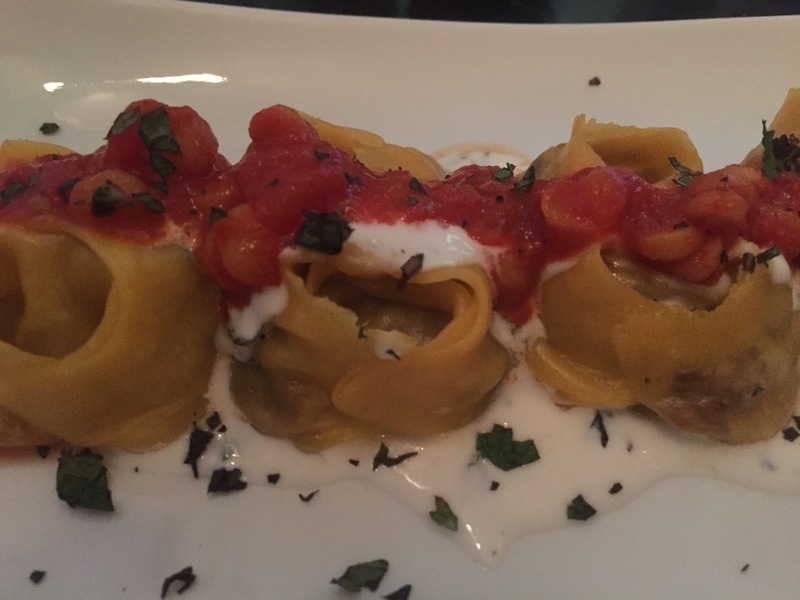 One of the special things about returning to a city you love is the opportunity to revisit favorite restaurants. Tonight we went to Evi Evane, 10 Rue Guisarde, our favorite Greek restaurant in Paris. 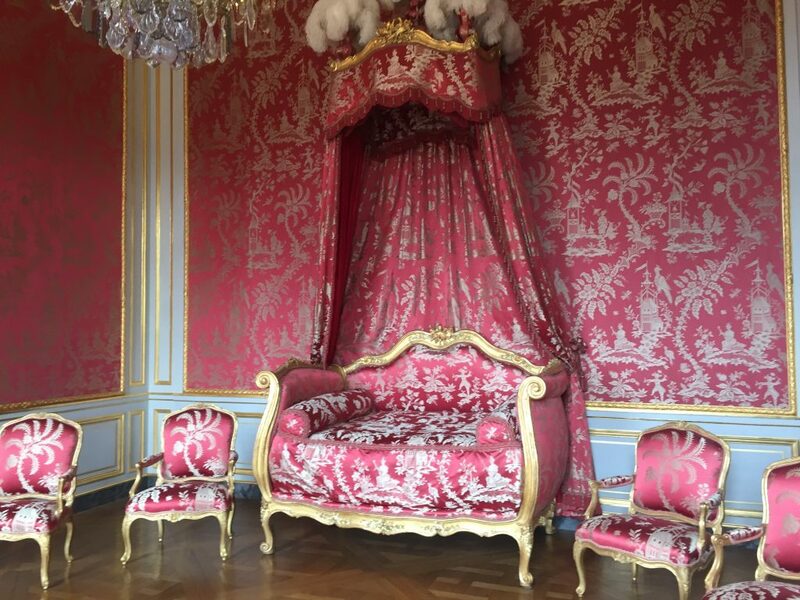 Part of what makes Paris amazing is the beauty everywhere you look. 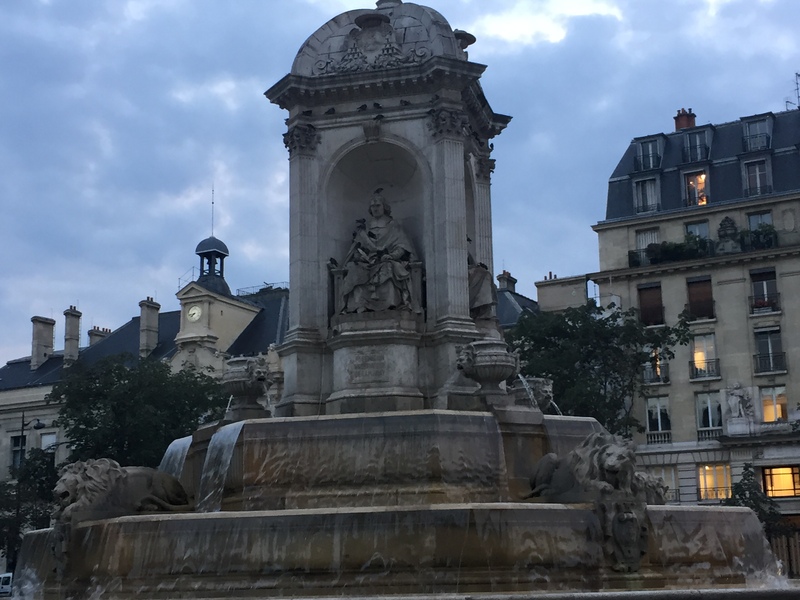 Walking around before our dinner reservation, we saw Place St. Sulpice on one side of the street. 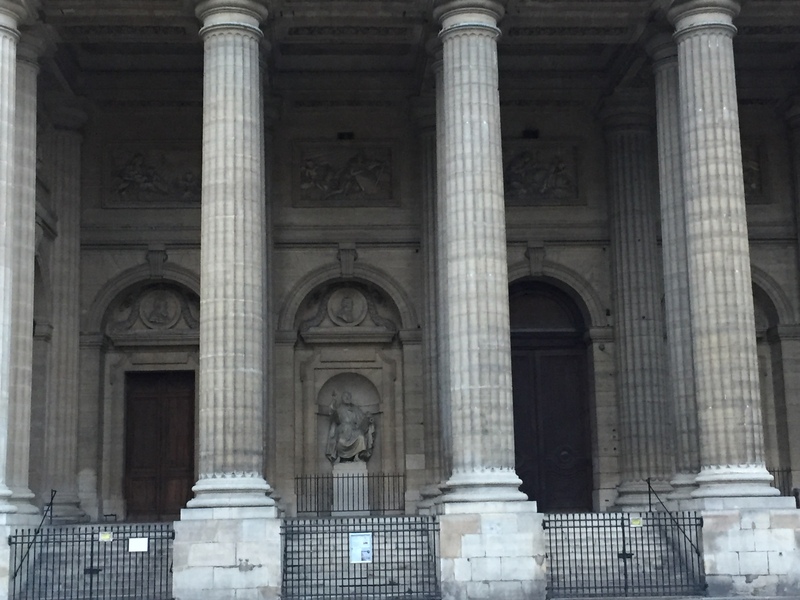 And the Church of St. Sulpice on the other side of the street. This entry was posted in Amsterdam, Bruges, Paris 2016 on September 19, 2016 by debbie. 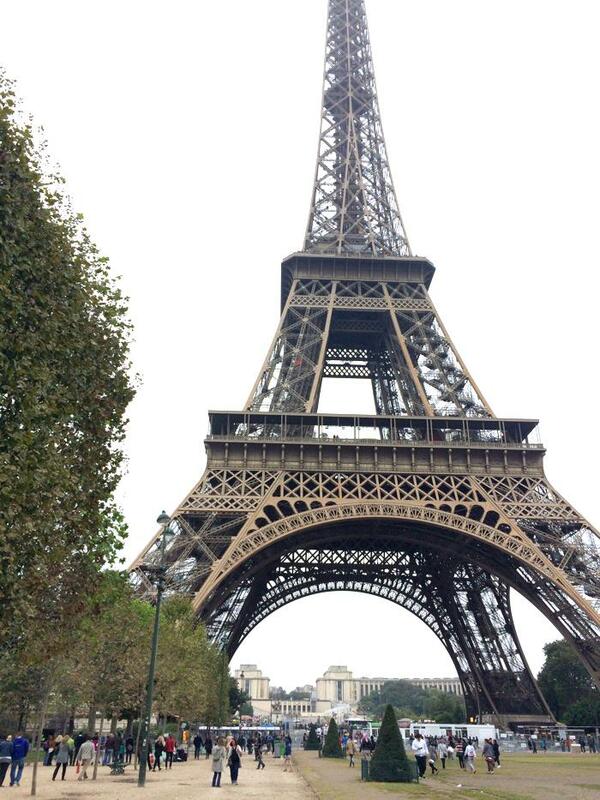 We took the high-speed train to Paris yesterday and settled into our home for the next seventeen days. 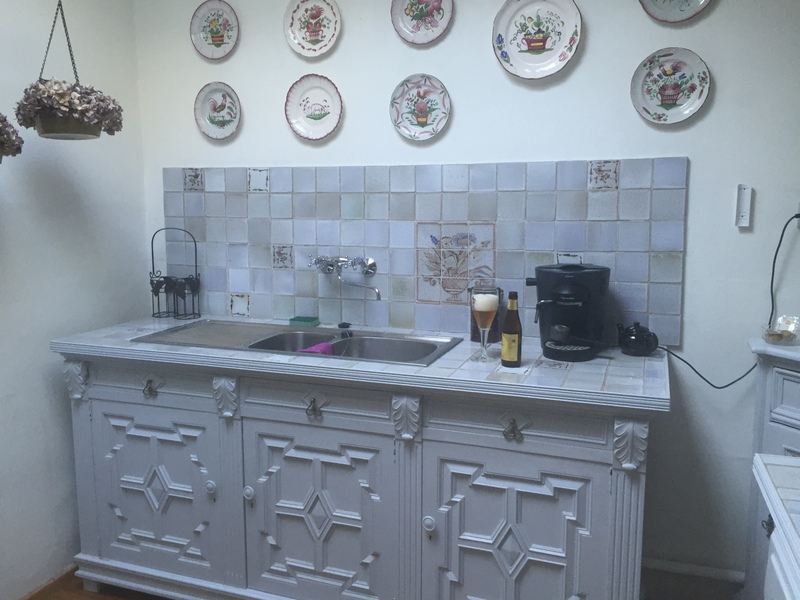 A half block off the Rue Cler, our third-floor apartment is cute, spacious and in a great location. An extra bonus is being a block from our dear friend Moira. After unpacking and exploring our new neighborhood, we met Moira for wine and cheese. 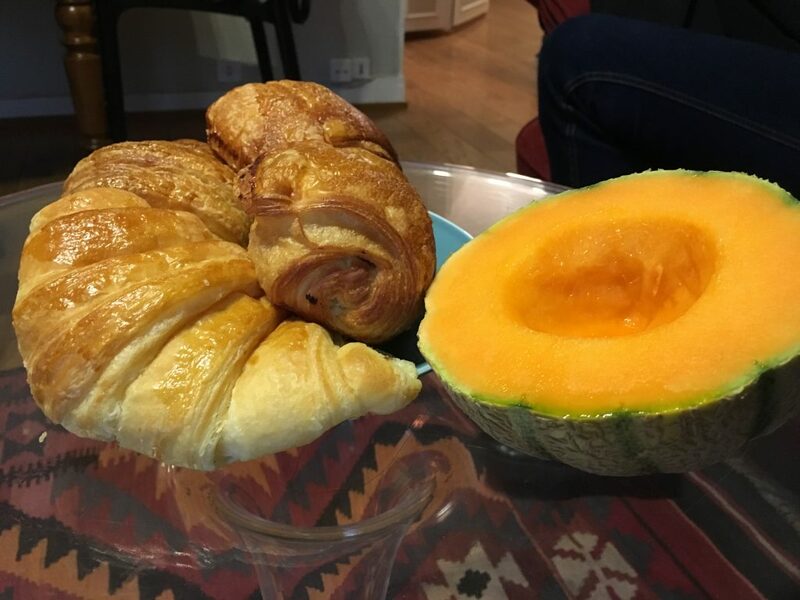 Freshly-baked croissants from our neighborhood boulangerie and a French melon- my favorite French breakfast. Small, aromatic and bursting with flavor, the little melons are tastier than any melon I have ever eaten. Going to the boulangerie just as it opens in the quiet morning time before our street gets busy is the best way to start a day in Paris. 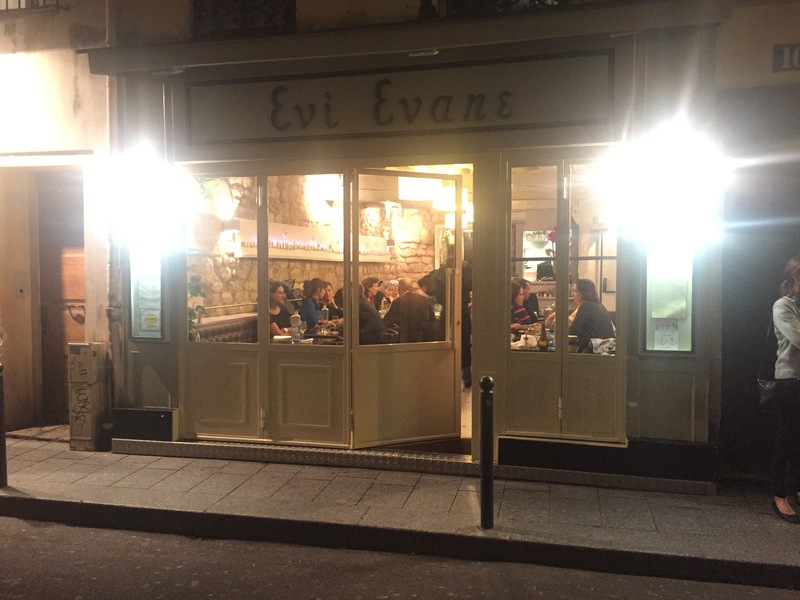 One of our favorite activities in Paris is to explore the neighborhoods without a set agenda and see what we discover. 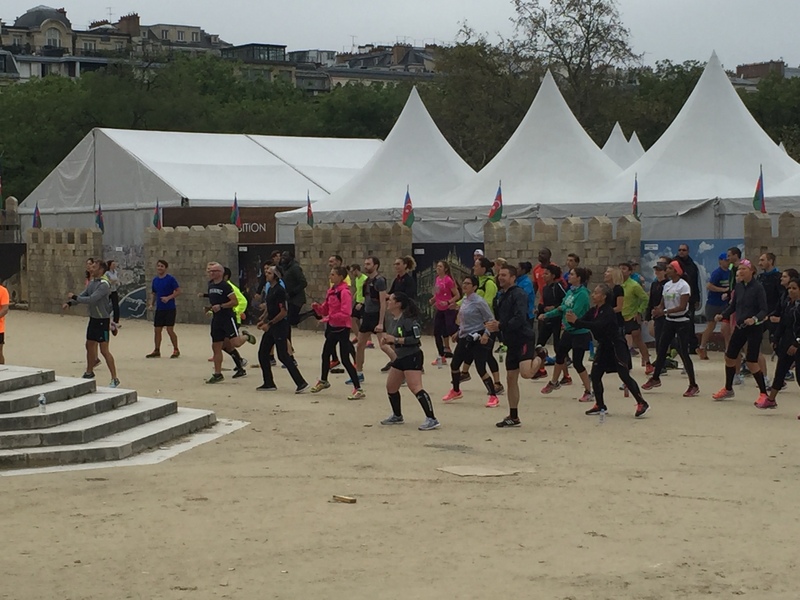 We started our walk this morning in the Parc du Champ de Mars. 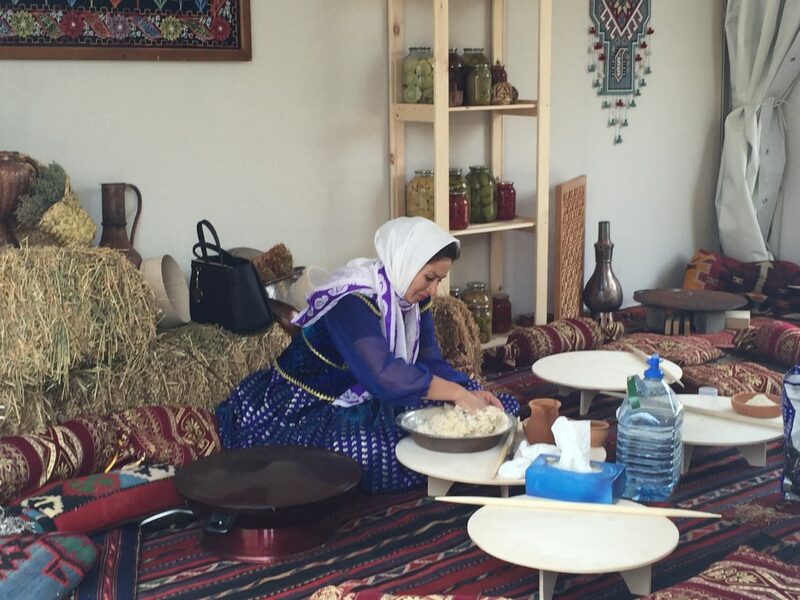 Behind a group of early-morning exercisers, we discovered an Azerbaijan village set up promoting their culture, food and art. 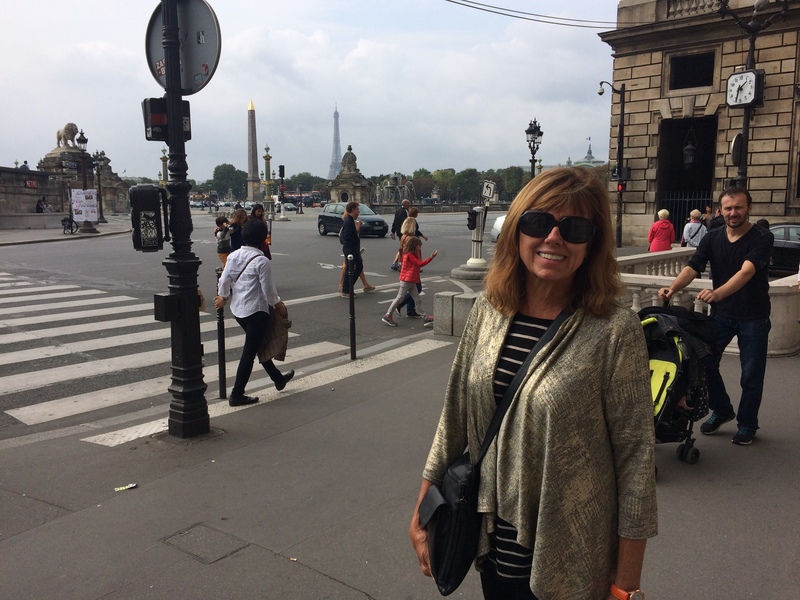 We continued our stroll past the Eiffel Tower and over the Seine to walk along Avenue Montaigne, home of many luxury designer stores. 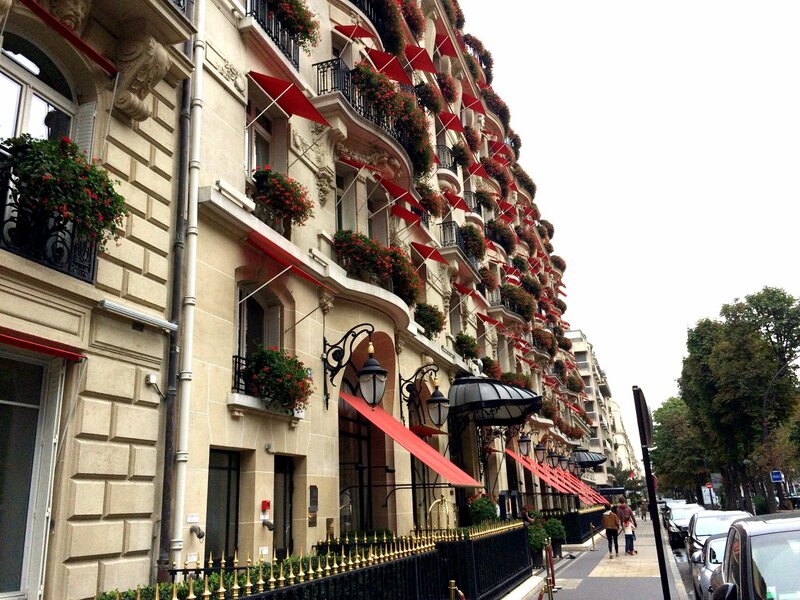 We noticed a particularly stunning building and discovered it was the 5-star hotel Plaza Athenee, where Alain Ducasse, France’s most famous chef, has a restaurant. 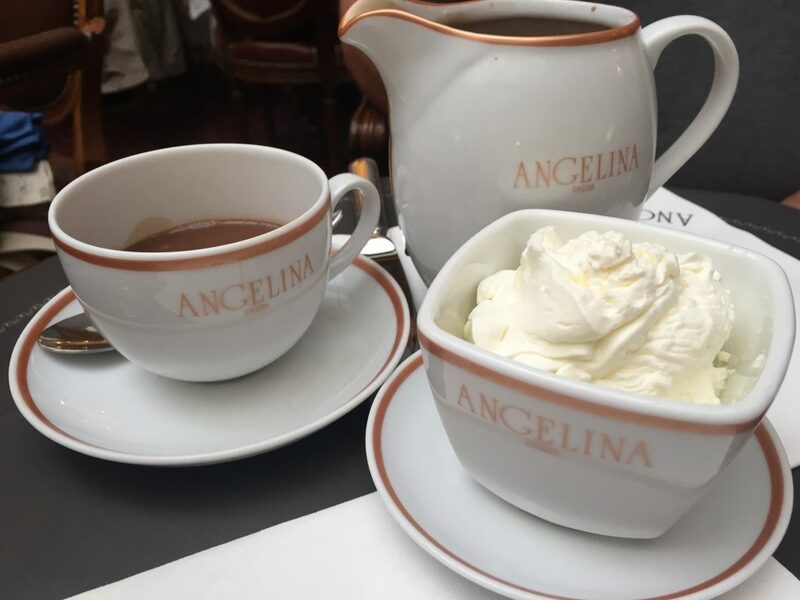 It was cool today, so chocolate chaud at Anglina’s, my favorite place for chocolate chaud, was a special treat. 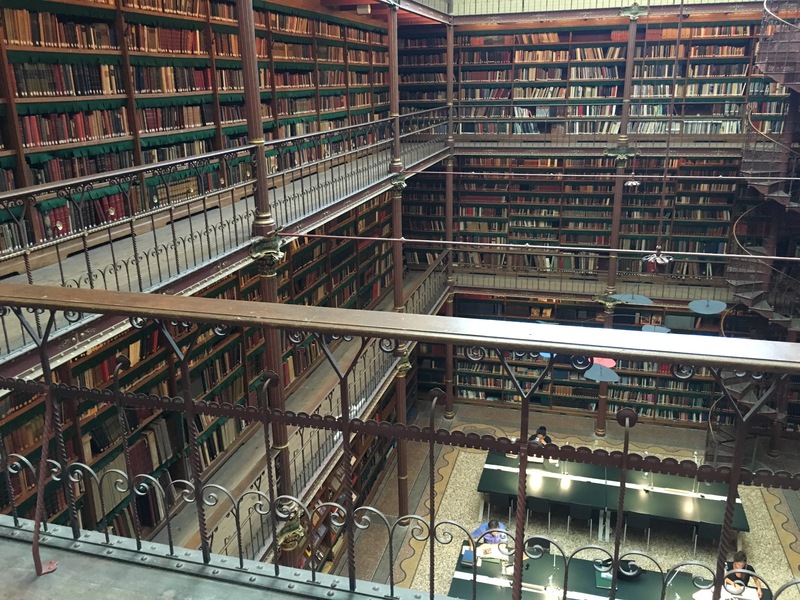 European Heritage Days, when many public buildings not normally open to the public open their doors to visits, are the third weekend in September. Last time we were in Paris we visited the beautiful Hotel de Ville, the building housing Paris’s local administration. This year we visited the Hotel de Talleyrand, a beautiful 18th century private residence that since 1950 has been owned by the US and is where the Marshall Plan was developed after WWII. We were able to walk right in, but many sites had long waiting lines. 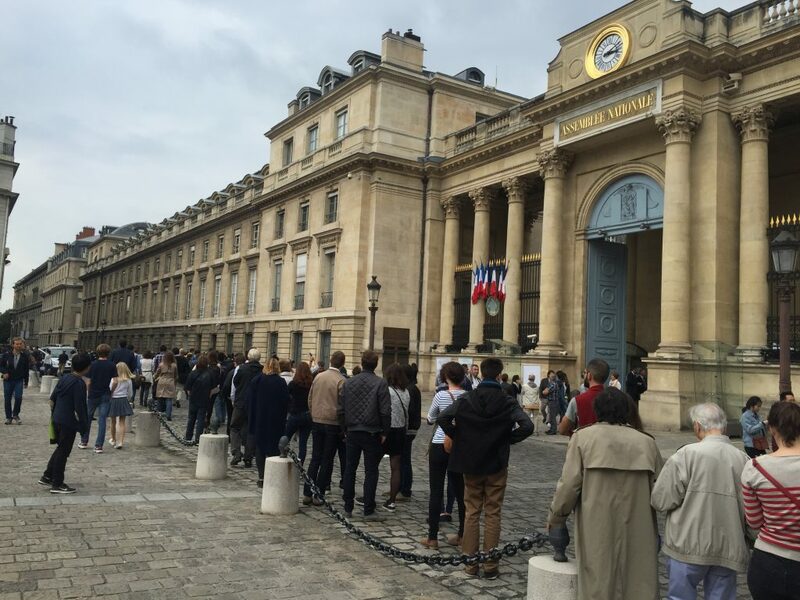 The wait to get into the Elysee Palais, the official residence of the President of the French Republic, was three to four hours. The roads and sidewalks around the building were barricaded and patrolled by armed police. 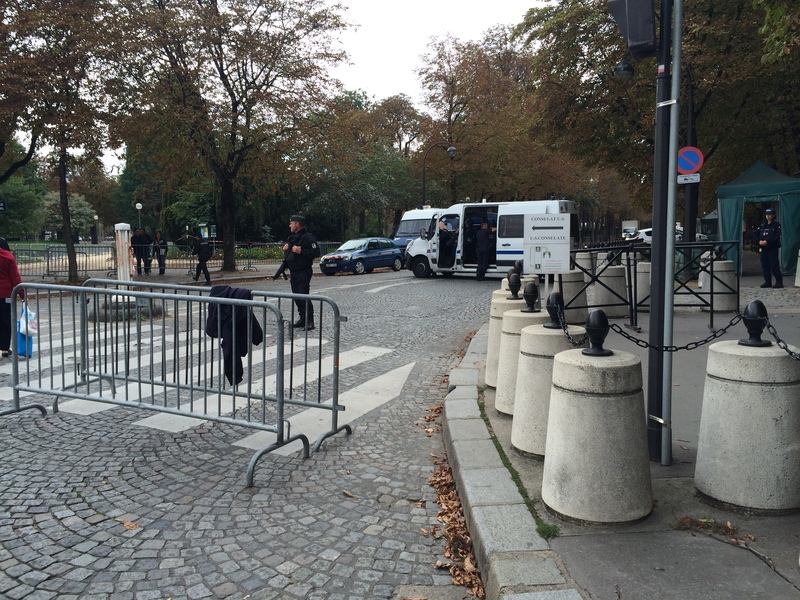 We were impressed with the security measures taken by the Paris police to ensure that a Nice-style attack was not repeated. 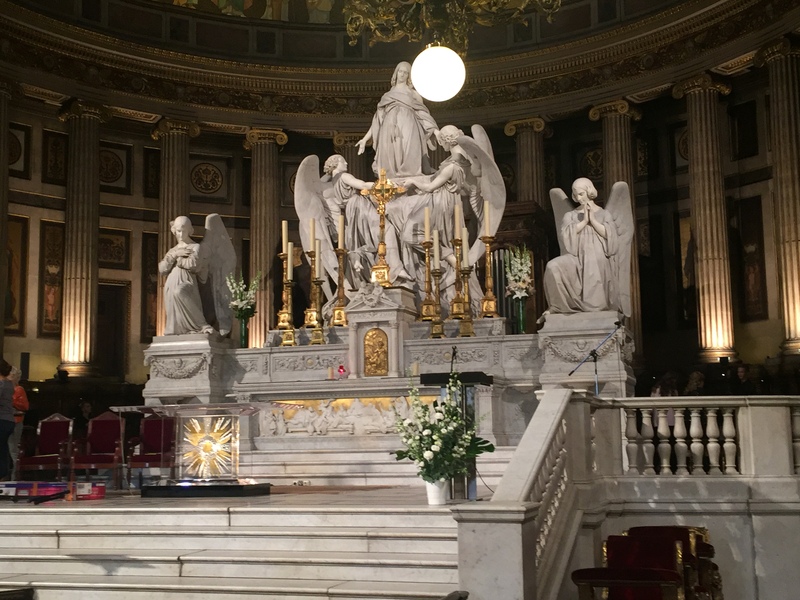 We made a stop at the beautiful L’Eglise de la Madeleine, an 18th century Catholic church built by Napoleon to glorify his army. Site of Chopin’s funeral in 1849, it now hosts classical music concerts. 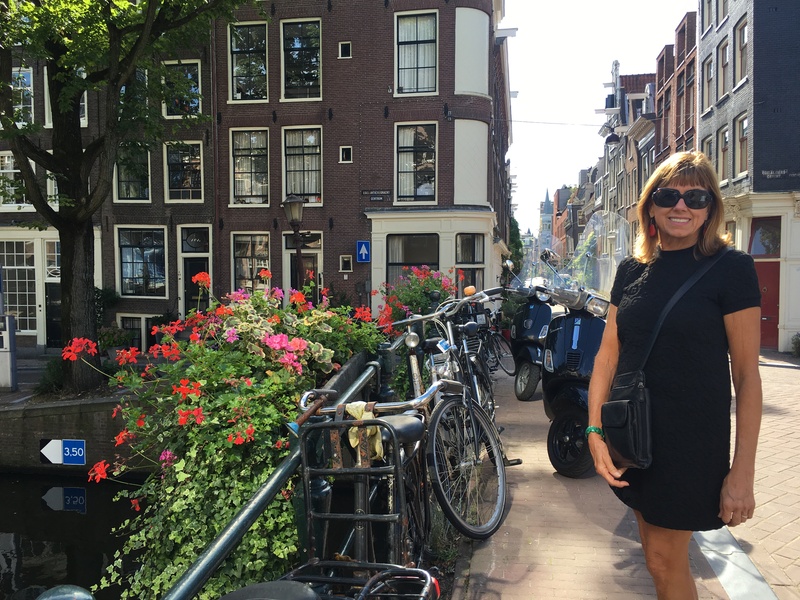 This entry was posted in Amsterdam, Bruges, Paris 2016 on September 18, 2016 by debbie. 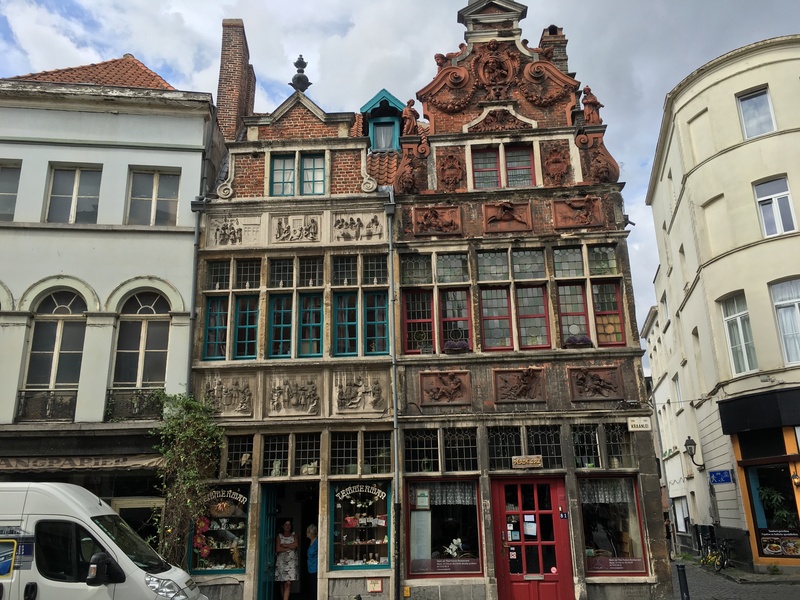 After watching Monuments Men and learning more about the Ghent Altarpiece, we decided to make a day trip to Ghent, a thirty-minute train ride from Bruges. 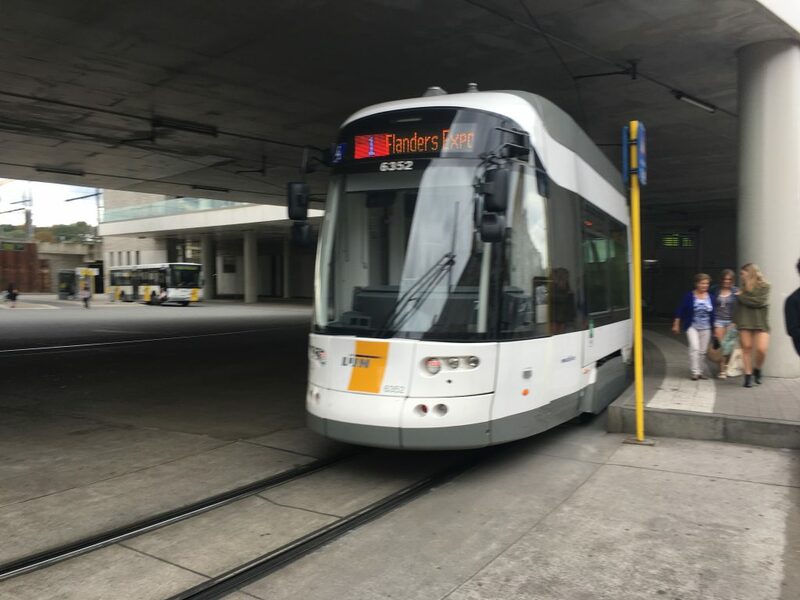 I always struggle a bit to figure out bus systems, so getting our Tram tickets and getting from the train station to Kornmarket, where we wanted to go, was a little hiccup. Two different kind strangers helped us, and the rest of the public transportation components of our day worked great. 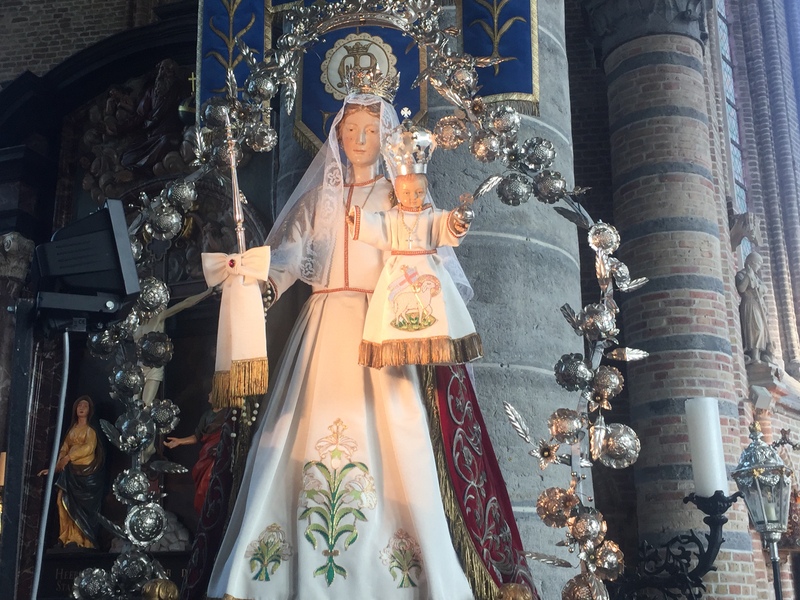 The highlight of the day was seeing the impressive Gothic Cathedral of St. Bavo and its beautiful Adoration of the Mystic Lamb altarpiece. 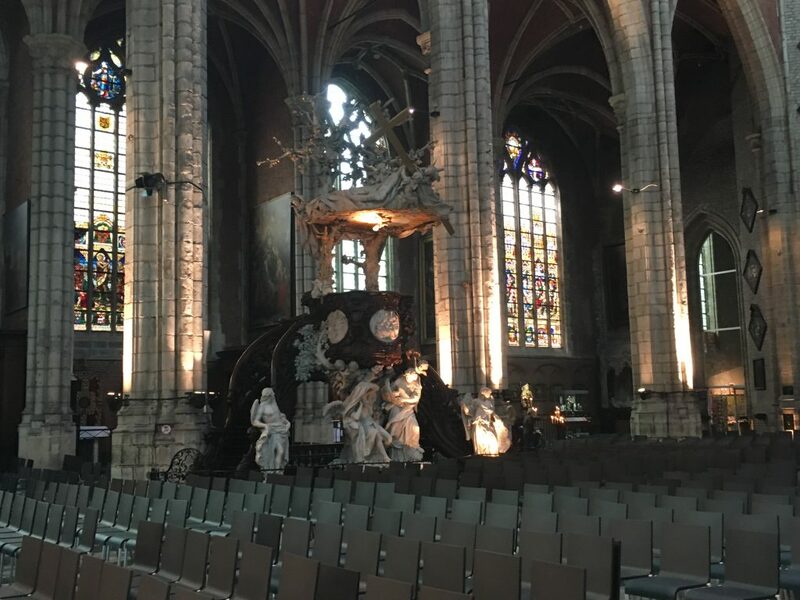 The Ghent altarpiece, as it is most frequently called, is in a special darkened chapel behind glass. 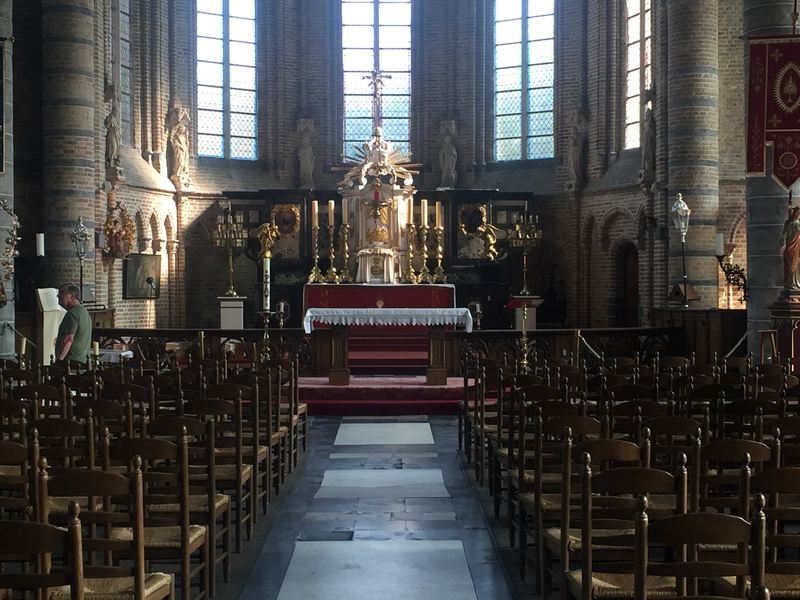 We felt lucky that for the first third of our time viewing the altarpiece, we were the only ones in the room. It never got as crowded as we expected. 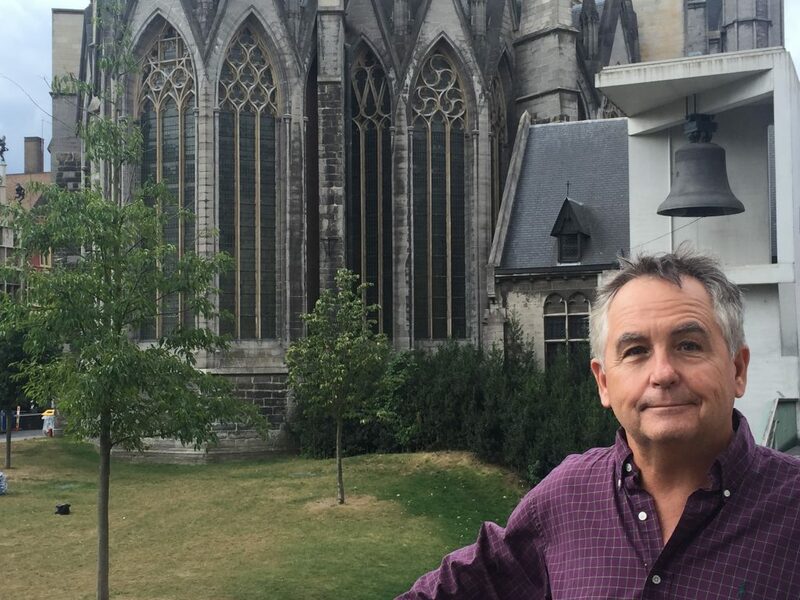 The Ghent altarpiece has been called the most influential painting ever made because it is the first masterpiece in oil and is probably the most stolen. 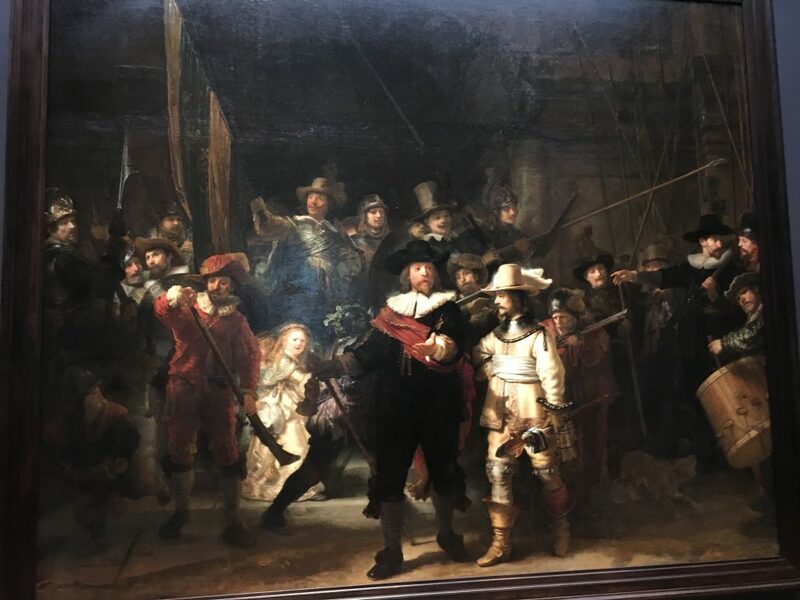 The lower left panel is still missing and has been replaced with a copy. 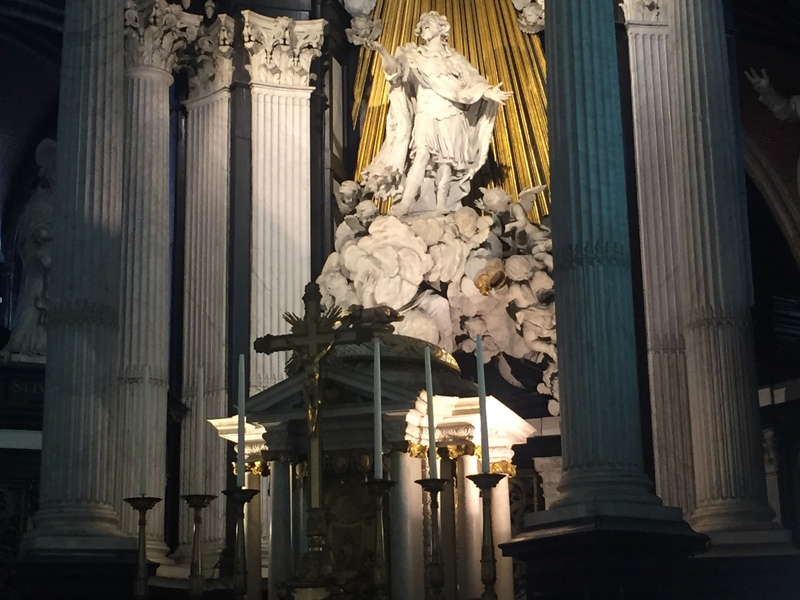 The outside of the cathedral was covered in scaffolding, but the inside was stunning. 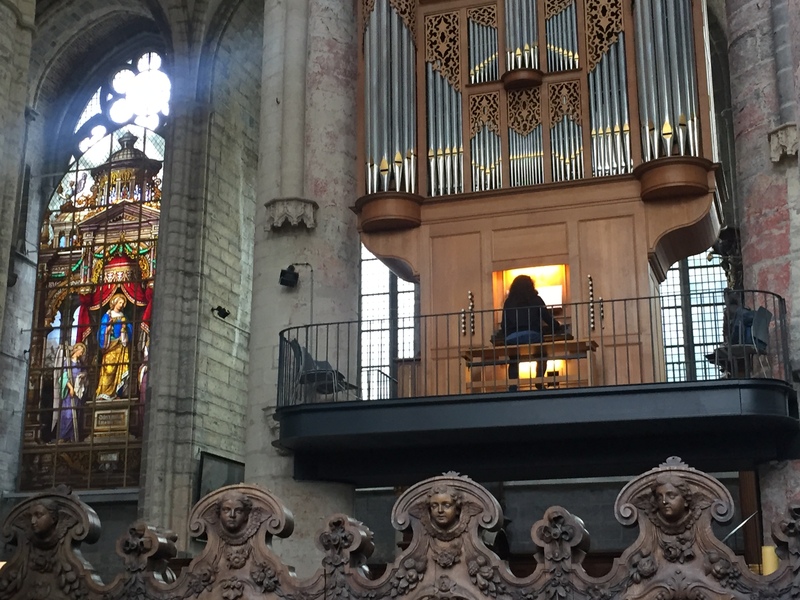 An organist playing the second-level organ as we entered certainly enhanced our experience. An amazingly intricate carved pulpit with a golden serpent and numerous Carrara marble statues was on the side of the nave. We ate lunch in the Patershol district at Souplounge, a little soup shop. Before ladling the soup into the bowl, they put little meatballs, fresh chopped onions and tomatoes and fresh herbs in the bottom. 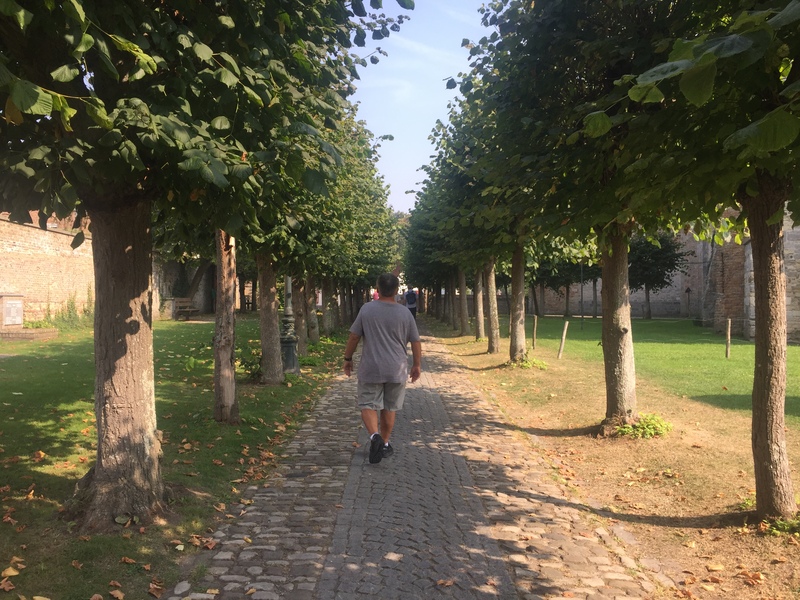 As we walked out of the restaurant, we noticed two intricate, quirky gabled buildings at the end of the road on our right. 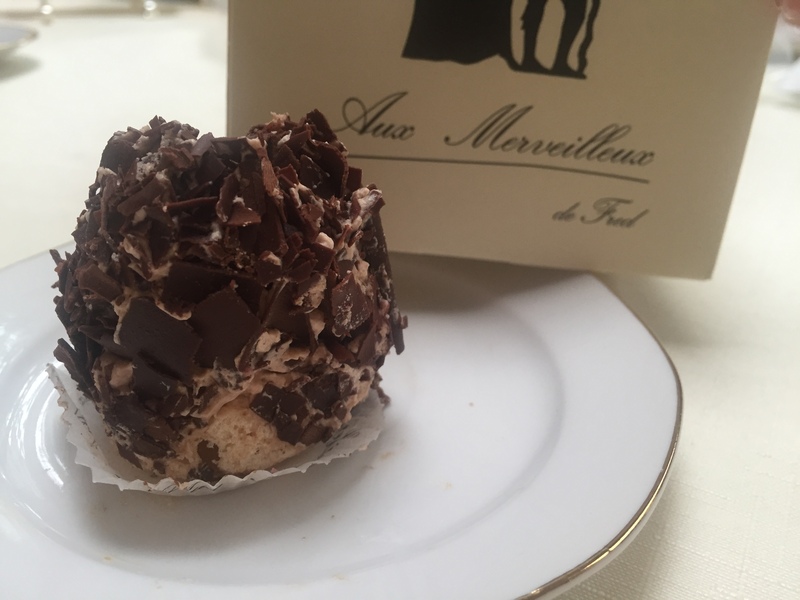 Walking home from the train station we discovered the amazing merveilleux,a small cake that originated in Belgium. It is an airy delicacy of meringue covered with whipped cream and various toppings. 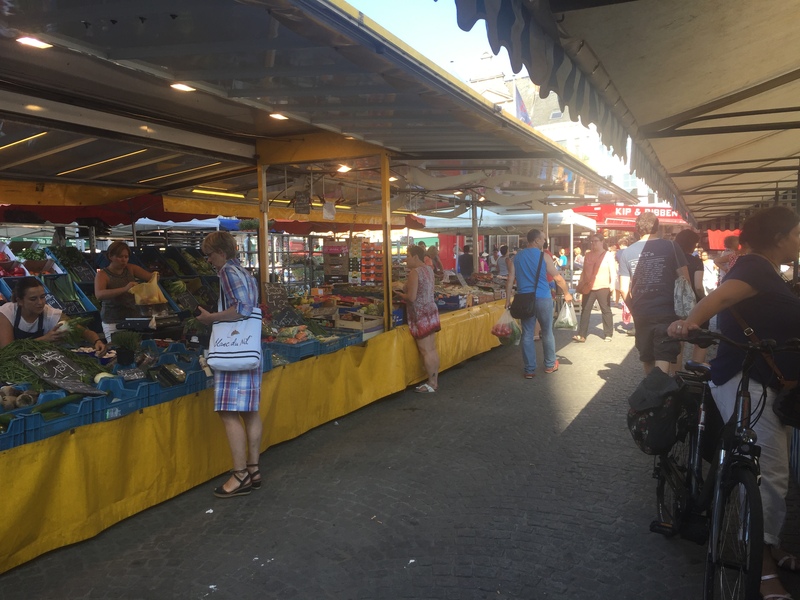 We had passed Aux Merveilleux de Fred on 3A Eiermarkt every day as we walked to the square and watched the bakers creating the little mounds but had never tried them. It is a good thing I waited until my last day here to have one because I think I could become seriously addicted. 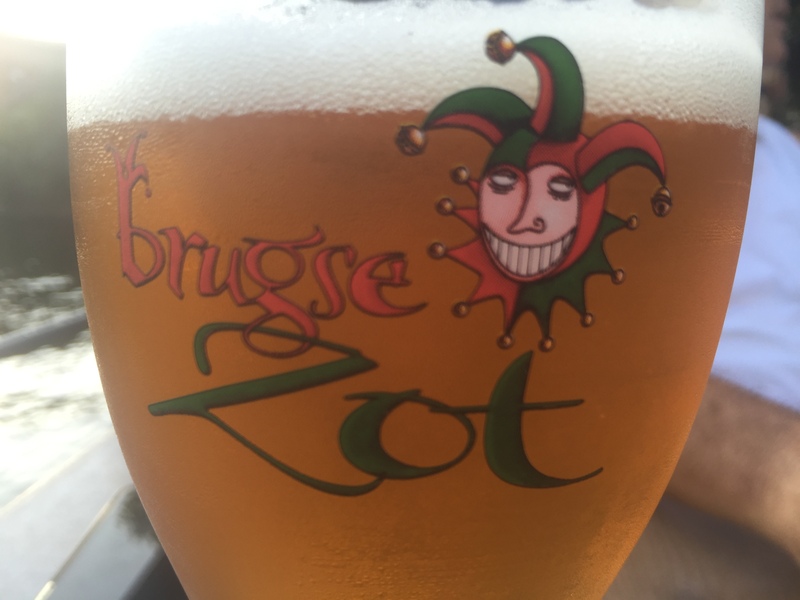 We were going to have one last Brugse Zot at the De Halve Maan Brewery, but they were closed to set up for a huge block party. They were celebrating the opening of their pipeline and thanking supporters and businesses around them who had been inconvenienced by the installation of the pipeline. We have enjoyed supporting their beer this week, but, alas, we were not on the invite list. 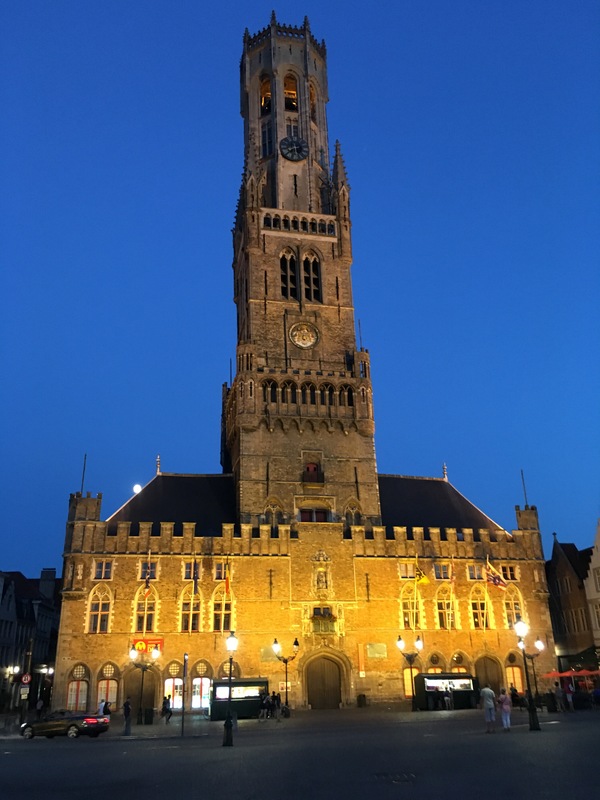 Bruges has been called the “Michelin epicenter of Belgium”, a country with one of the highest concentrations of Michelin-starred restaurants in the world. On our host’s recommendation we decided to try Kok au Vin, Ezelstraat 21, one of the restaurants that Michelin’s Bib Gourmand identified as a rising star. 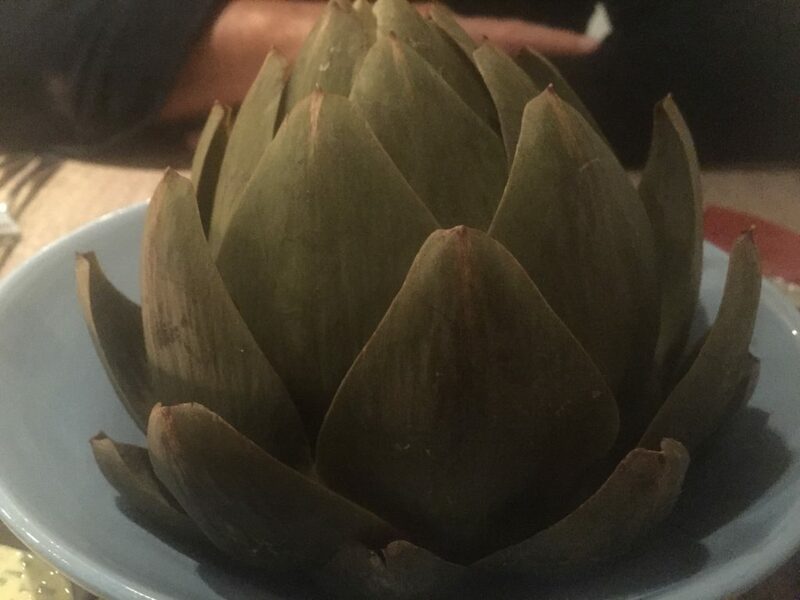 We started with an organic, farm to table artichoke. 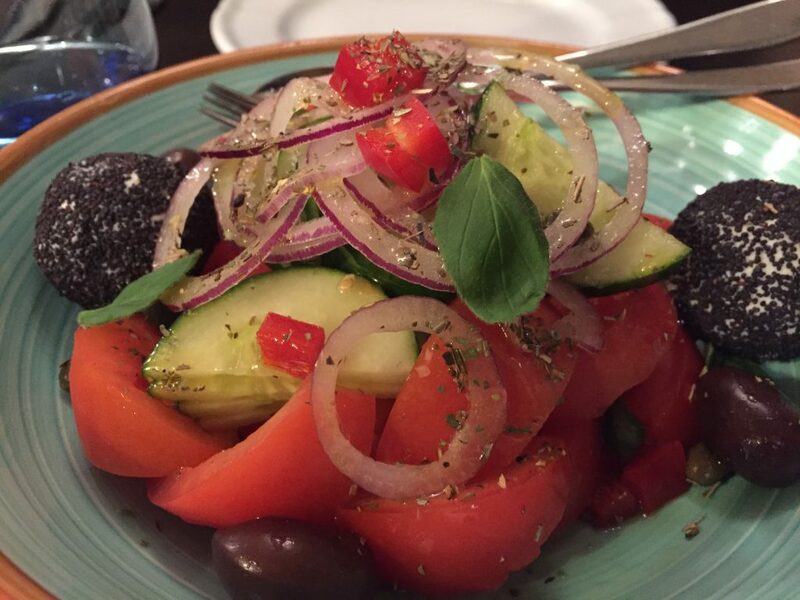 As much as possible, their produce and meat are organic, farm-to-table. After warm, sunny weather every day our trip, tonight it started to rain. We walked to the restaurant, a few blocks from our apartment, in a cool, rainy drizzle-very cozy. 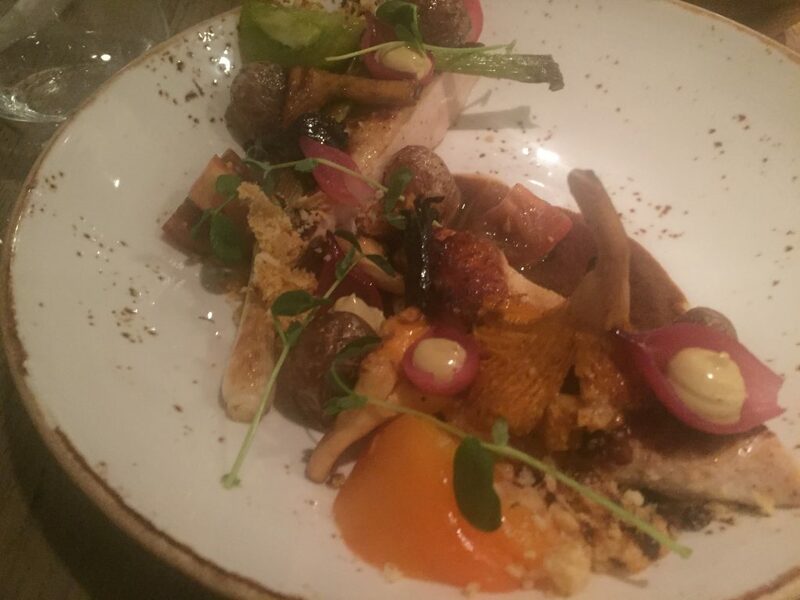 Paul had a chicken dish, and I had pork. Debbie at the tram stop. 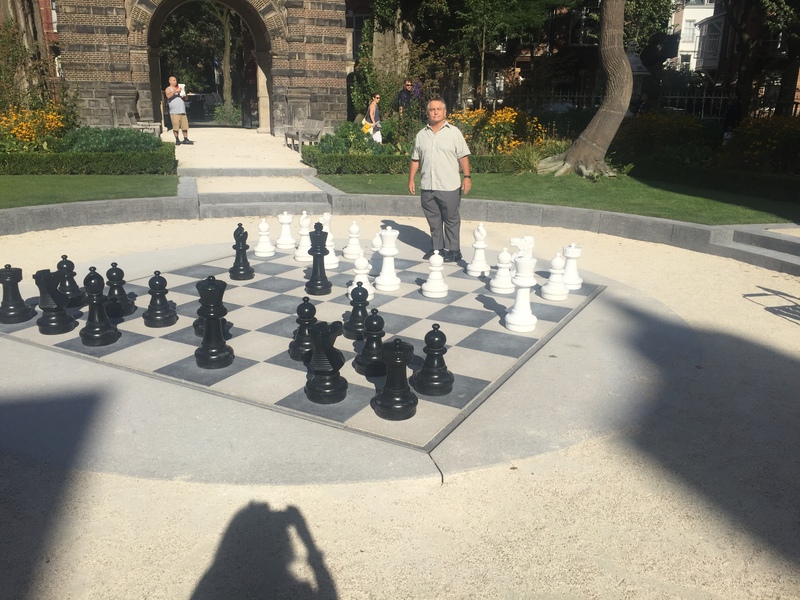 This entry was posted in Amsterdam, Bruges, Paris 2016 on September 16, 2016 by debbie. Think of Bruges, think of the Bell Tower, especially for those who have seen In Bruges. 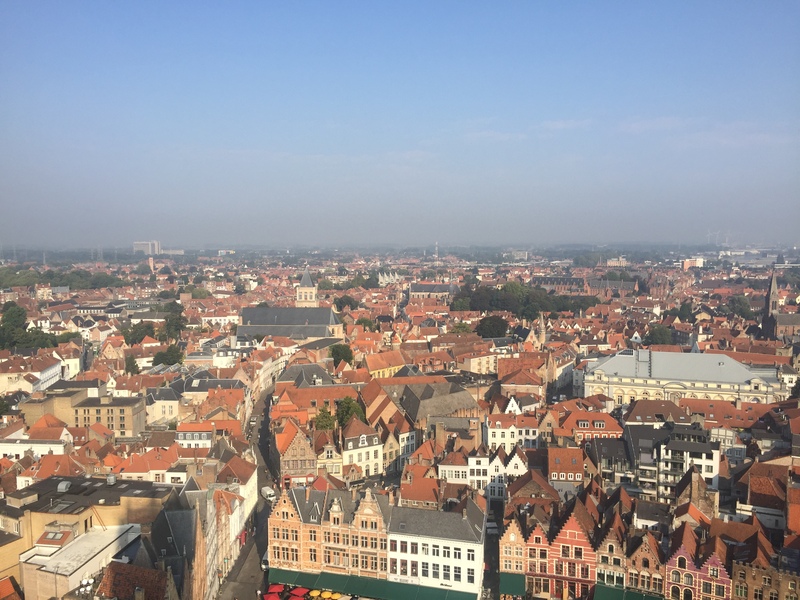 Climbing the 366 spiral steps of the Bell Tower was our first adventure of the day, and we were rewarded with beautiful views of this beautiful city. 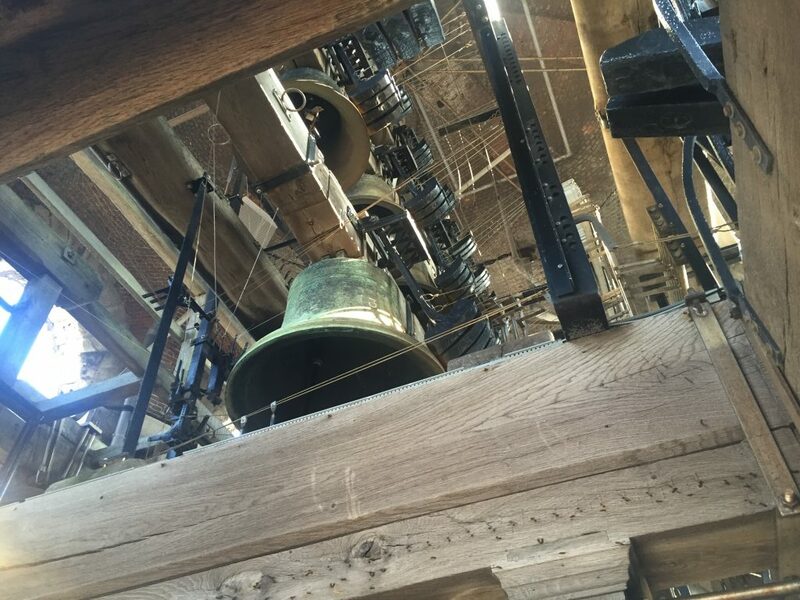 Since 1300, the Bell Tower has provided time keeping and beautiful carillon music. 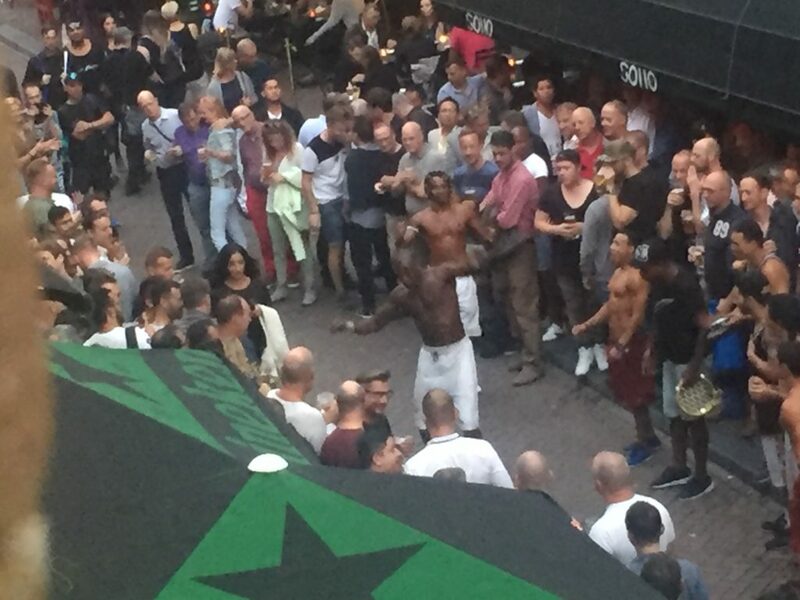 It was pretty amazing to be right by the bells when they started ringing. After climbing the tower, we rented bikes and rode to the charming little town of Damme, only four miles from Bruges. Being helmet-wearing, turn-signaling, trail-riding bikers, we were less than confident sharing the narrow roads with cars and other bikers. 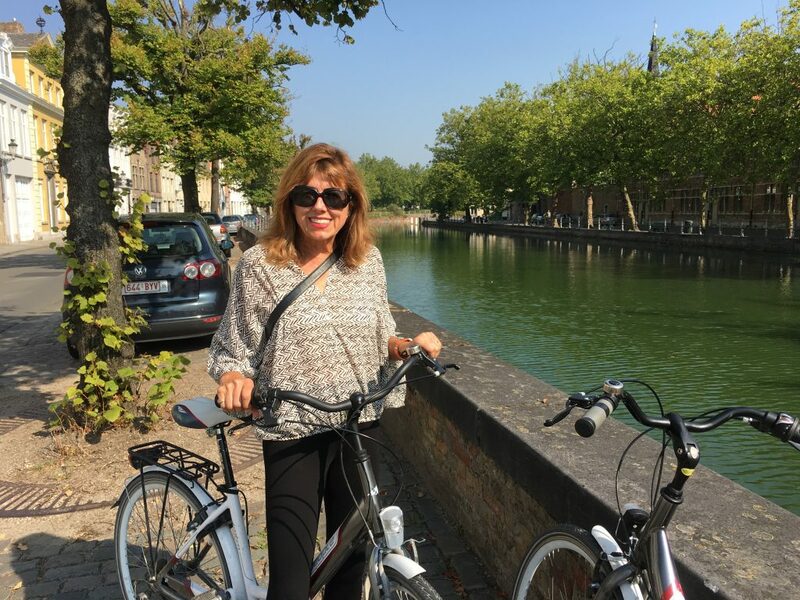 Soon we were out of Bruges and on a beautiful bike path along a canal built by Napoleon. 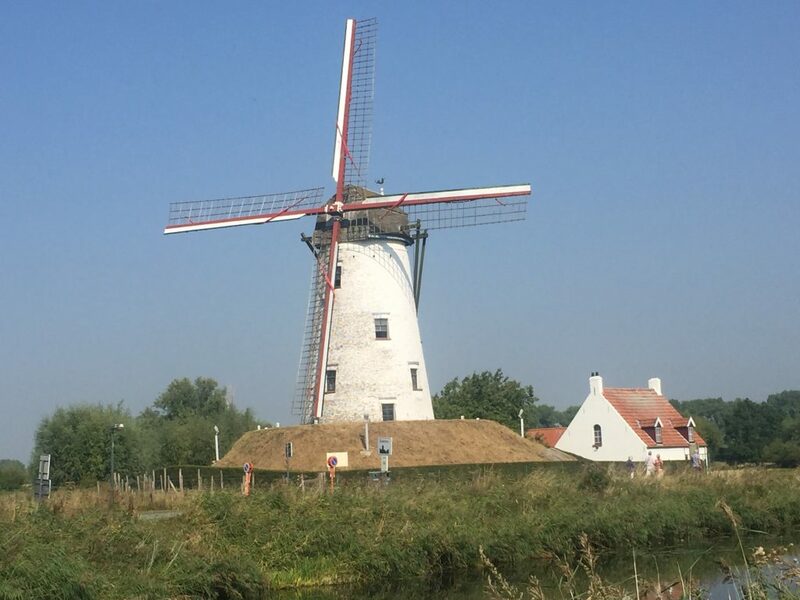 We passed a working windmill. On weekends it is open for tours. Ready for a break when we arrived in Damme, we stopped for lunch at an outdoor cafe. After lunch, we enjoyed a peaceful visit to the 13th century Church of Our Lady. The interior was beautiful, and the well-tended cemetery had beautiful grave markers. 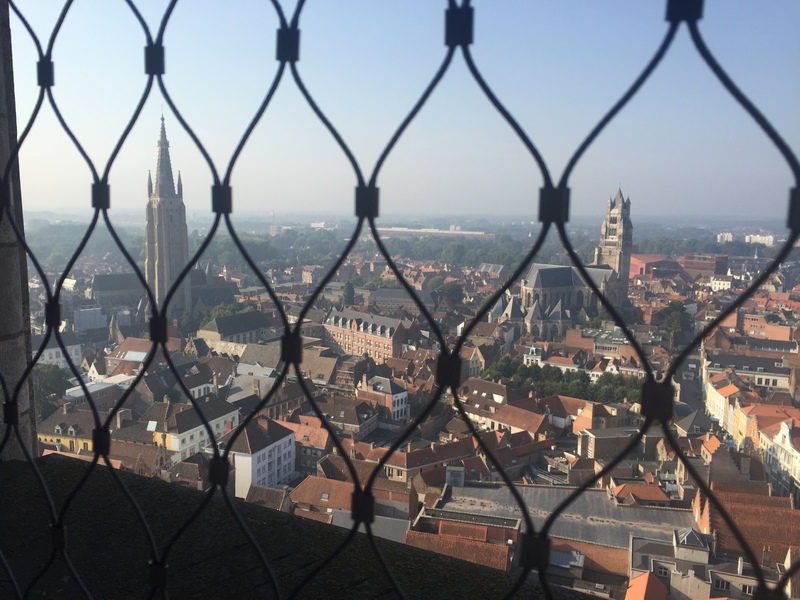 We biked back to Bruges and around the perimeter of the city. 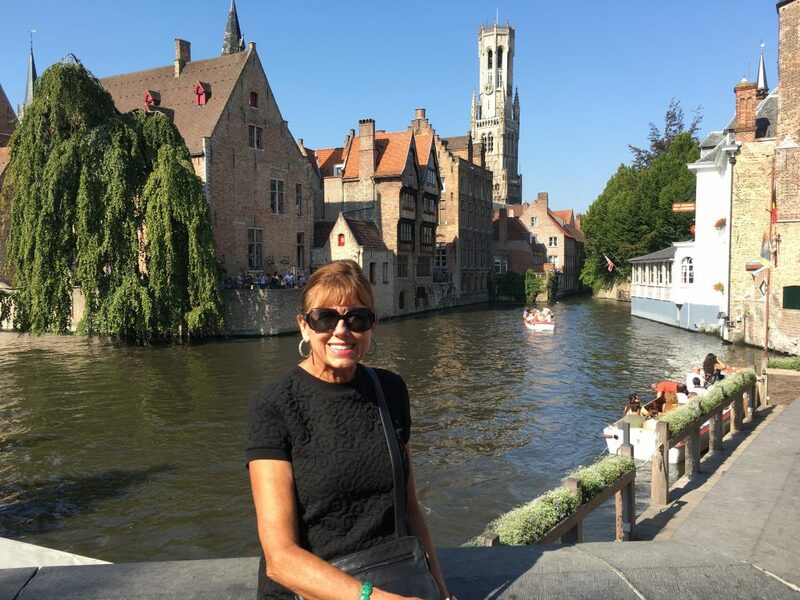 Bruges is surrounded by canals with narrow parks running alongside the canals. 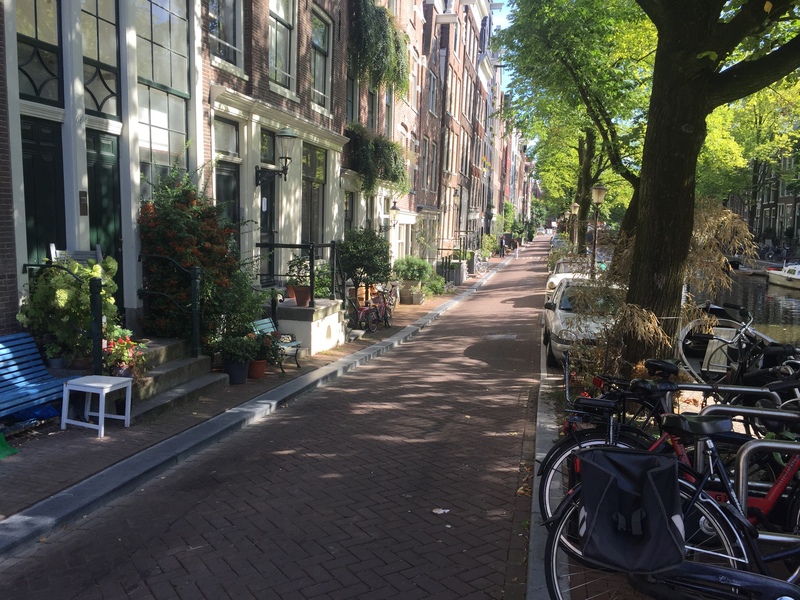 It was fun to bike through some of the residential areas. 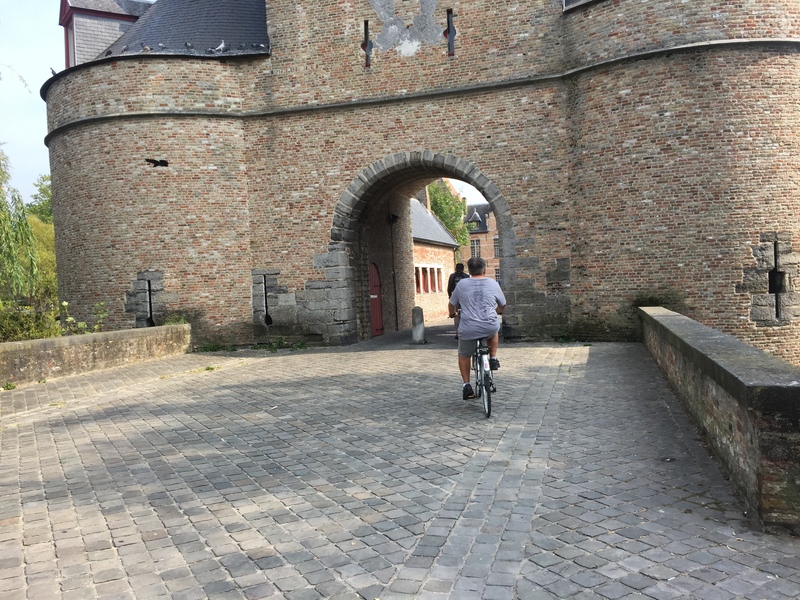 We headed back to Bruges Bike Rental through one of Bruges’ four medieval town gates. 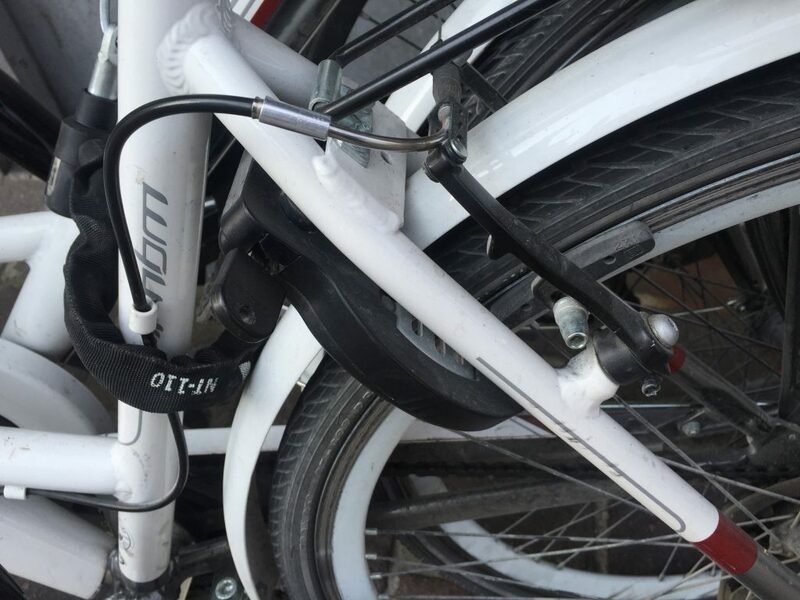 Our rental bikes had great locking systems. On the back wheel was a little brace with a key. When we stopped, we pressed the lever which locked the wheel and took the key with us. Coming back to our bikes, we put in the key, gave it a little turn and the brace unlocked. After days of planning to have an authentic Belgian waffle, I finally enjoyed one at Lizzie’s Wafels. 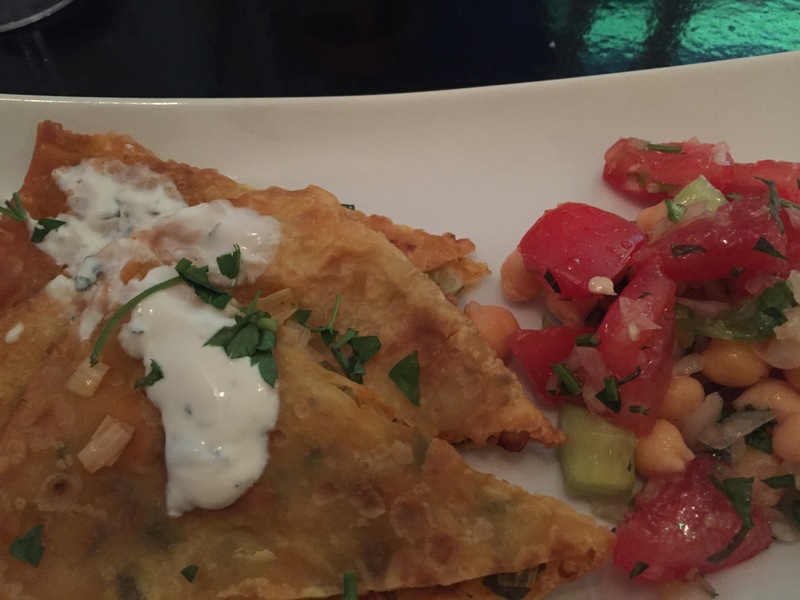 It was crispier than I expected, but it was absolutely yummy. 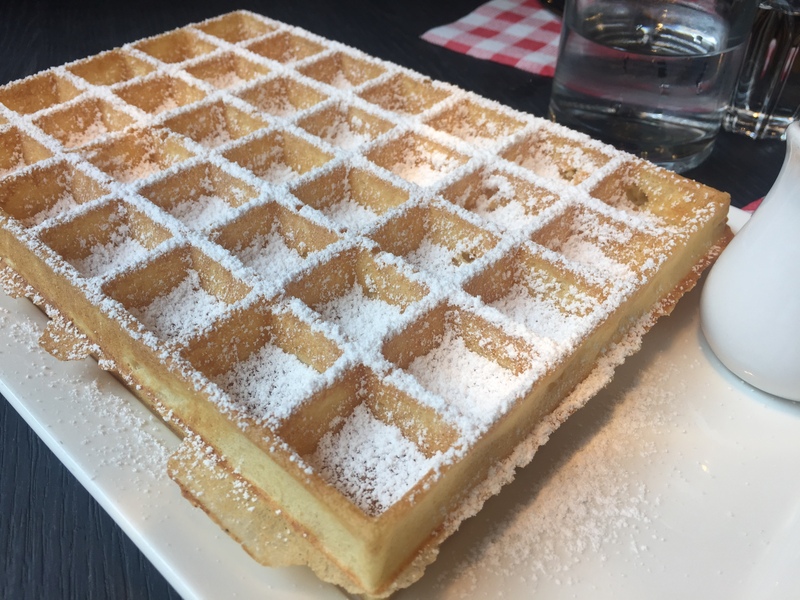 Unlike some of the waffle stands where the stacks of waffles wait to be ordered, Lizzie’s makes each waffle after you order it. 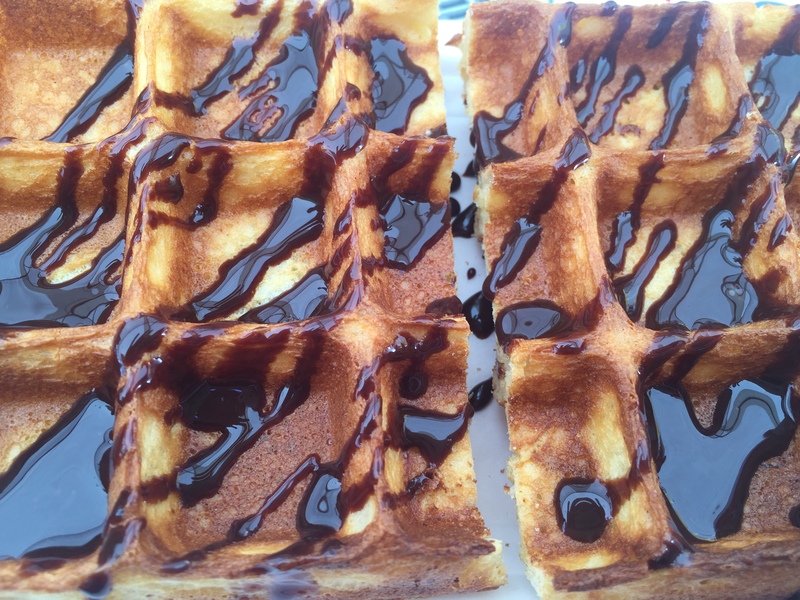 A little caramel sauce, and we were in waffle heaven. 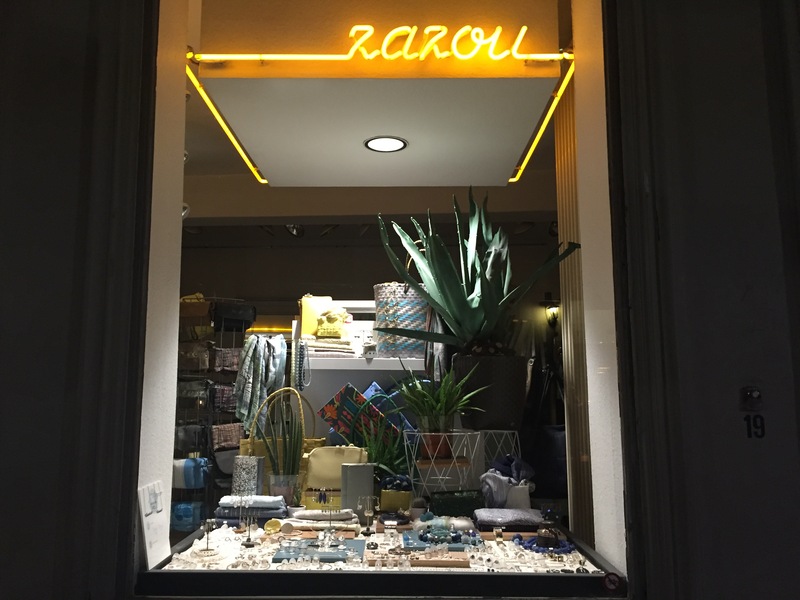 I discovered Zanzou, a darling little jewelry store on Sint Amandsstraat 19 that makes their jewelry on site and has reasonable prices. Paul had a hankering for steak, so we ate dinner at El Churrasco, an Argentinian restaurant on Vlamingstraat 76 rated 29th out of 566 Bruges restaurants on TripAdvisor. 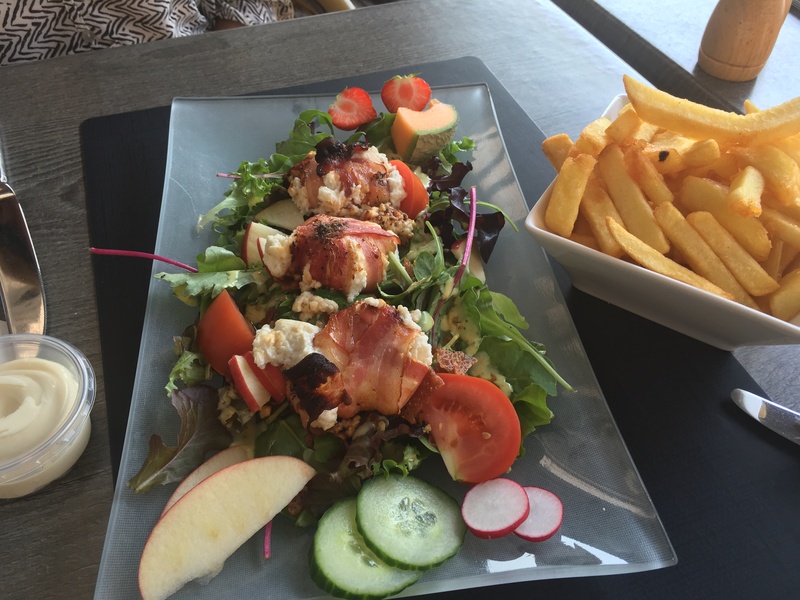 The service and food were excellent. 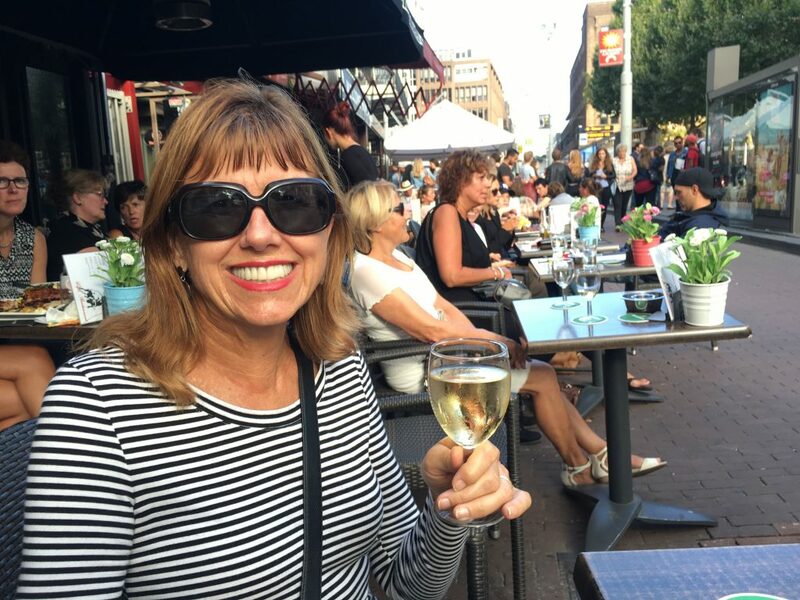 This entry was posted in Amsterdam, Bruges, Paris 2016 on September 15, 2016 by debbie. 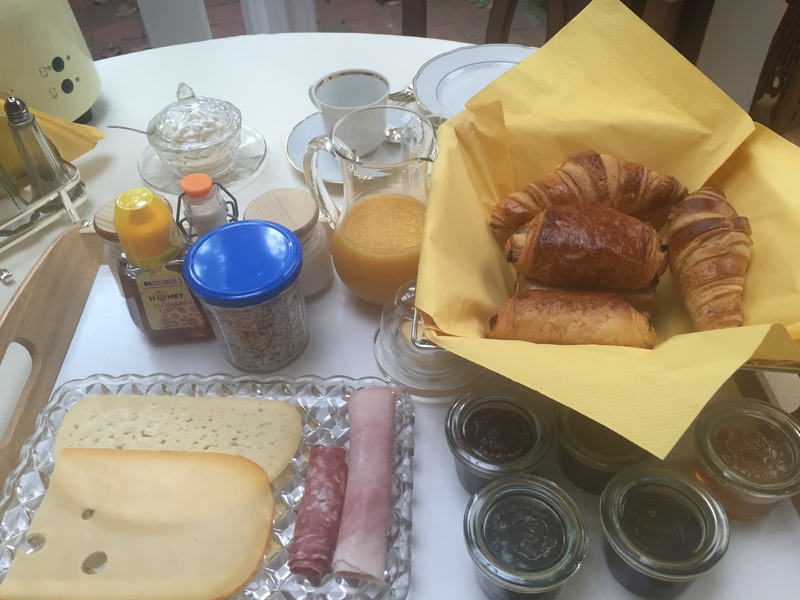 Our first full day in Bruges started with a lovely breakfast Michael left outside our door. 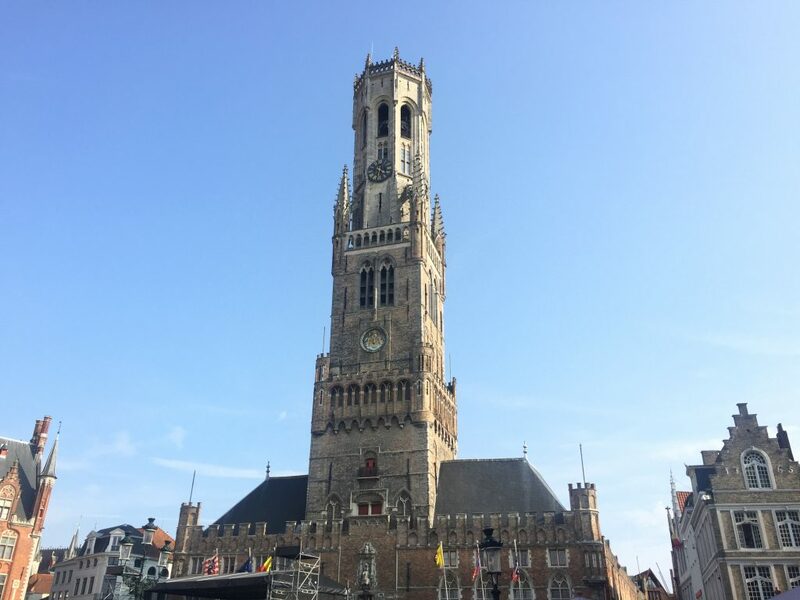 Then we were off to tour some of the beautiful Bruges highlights. 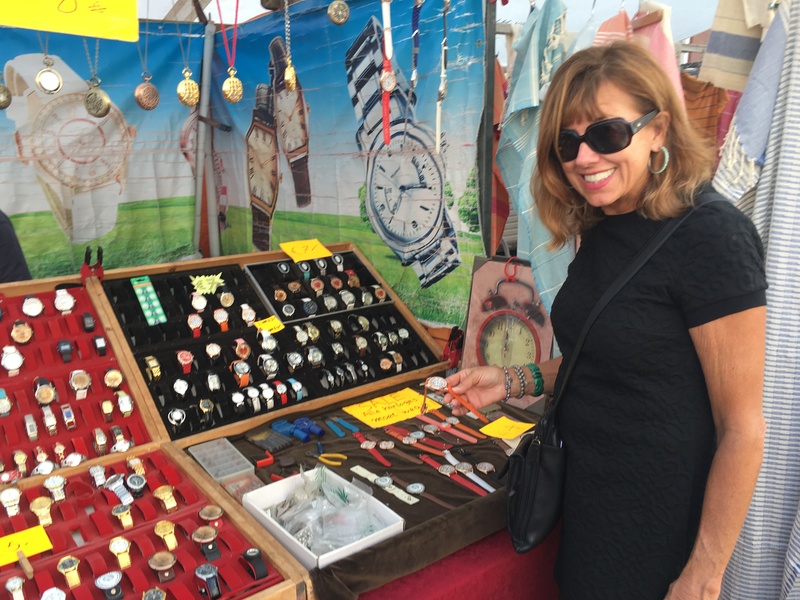 Today was market day in the square. 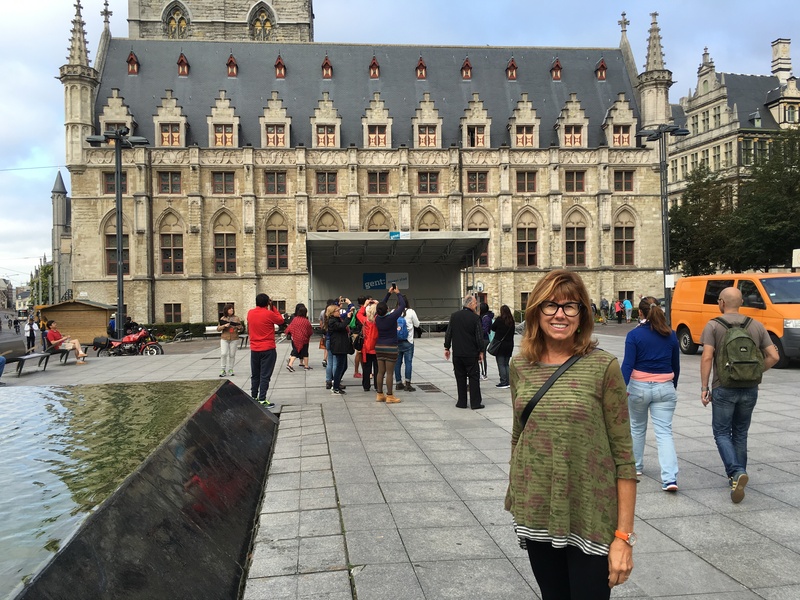 We saw the beautiful buildings in Burg Square, including the Basilica of the Holy Blood. 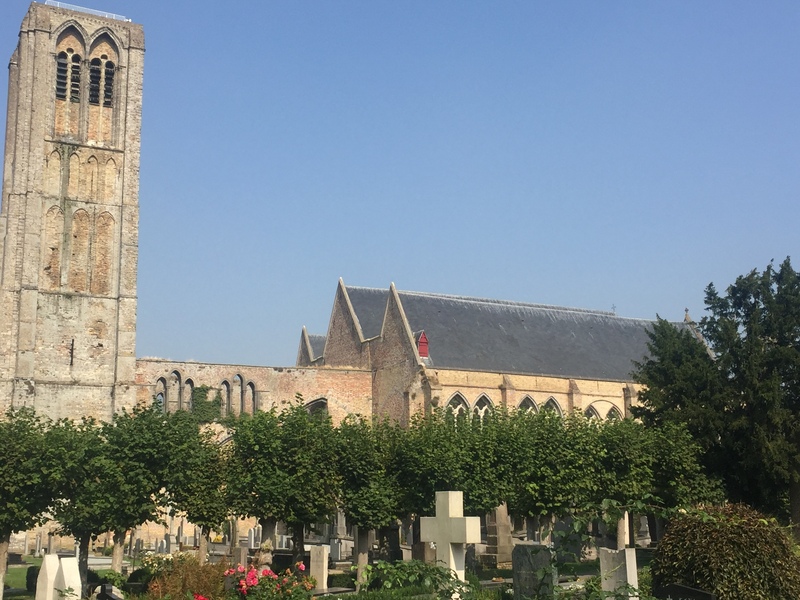 It was built in 1150 for the sole purpose of housing drops of Christ’s blood that Derrick of Alsace brought home from the Second Crusade. The dried blood is preserved inside a clear tube. Today the vial was on display and people lined up to put their hands on the case around it and say a prayer. 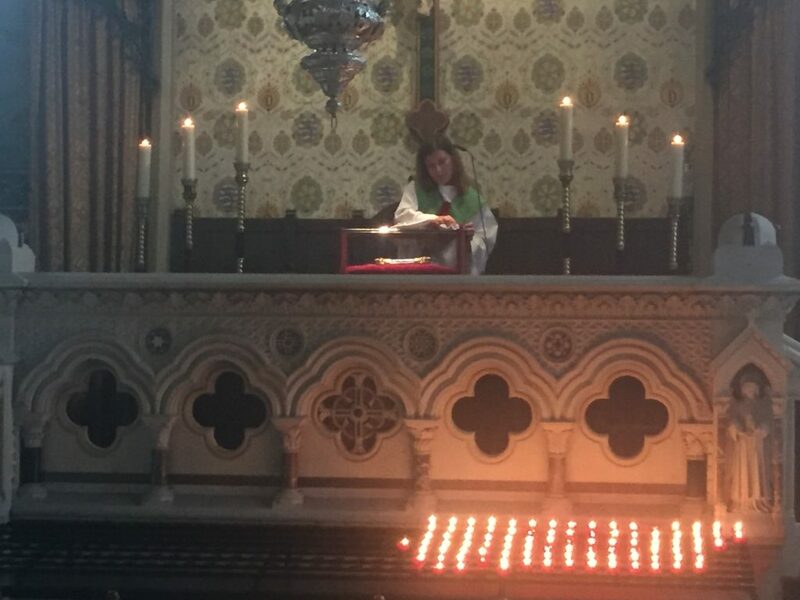 After each person moved on, a woman in priestly robes wiped the top before the next person approached. I don’t think the vial is normally on display. 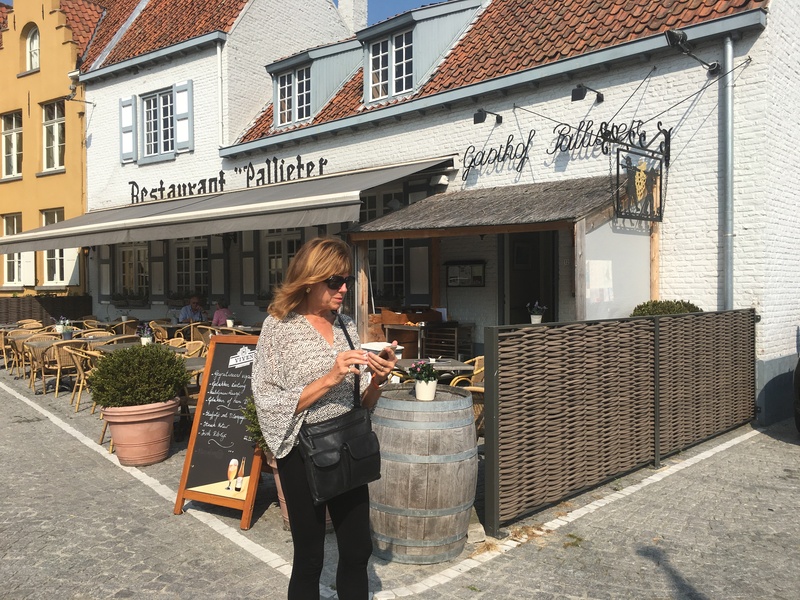 After visiting other historic buildings we came to Bruges’ most photographed spot, so, of course, we took a photograph. 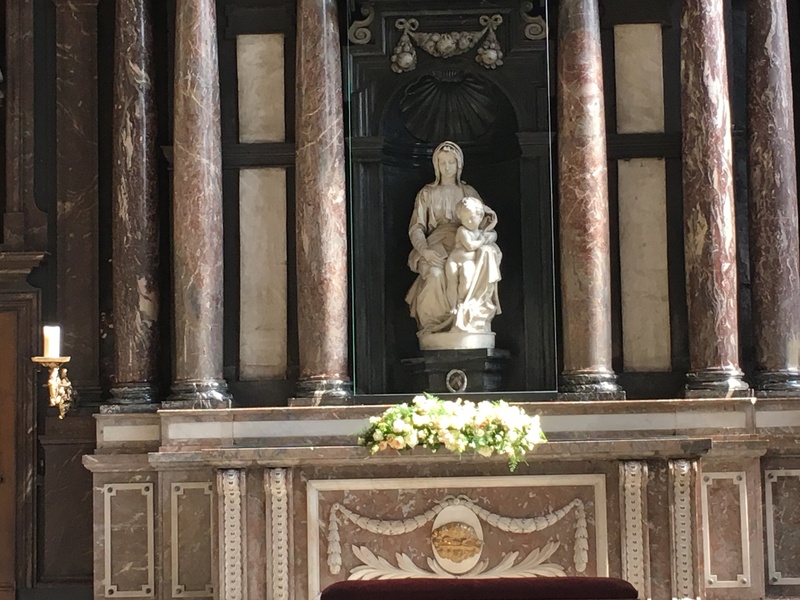 Visiting another church, the Church of Our Lady, we saw Michaelangelo’s beautiful Madonna and Child, one of the few Michelangelo sculptures found outside Italy. Since I enjoyed my first glass of Bruges’ Bruges Zot beer yesterday I have been looking forward to touring the De Halve Maan brewery. 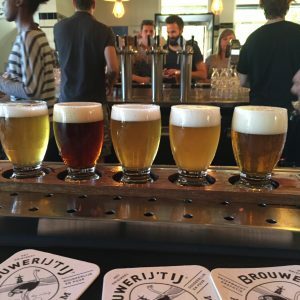 The beer has become so popular that their sixth-generation brewery can no longer process the beer in their heart-of-Bruges location. So they have just completed an underground pipeline from the brewery to a bottling plant outside of town. 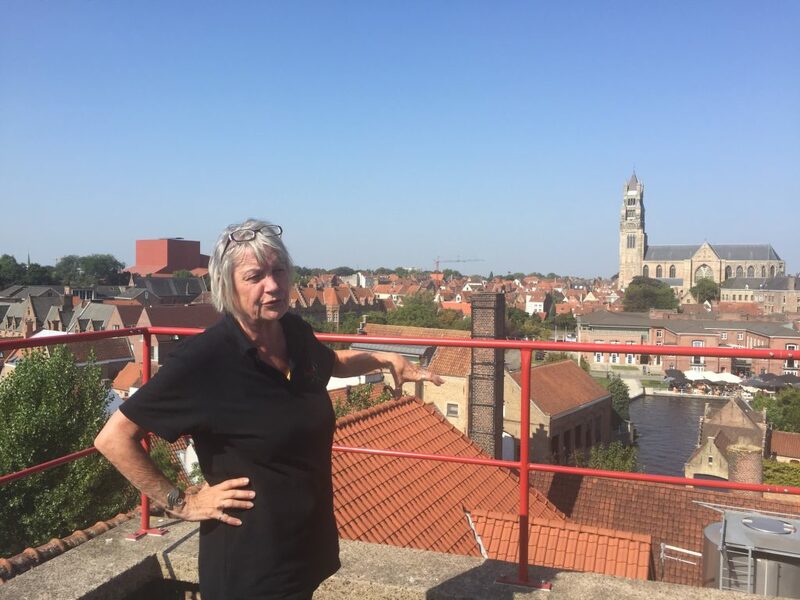 Standing on the top of the brewery, we could see the beer’s destination in the distance. Our tour guide was quite entertaining. 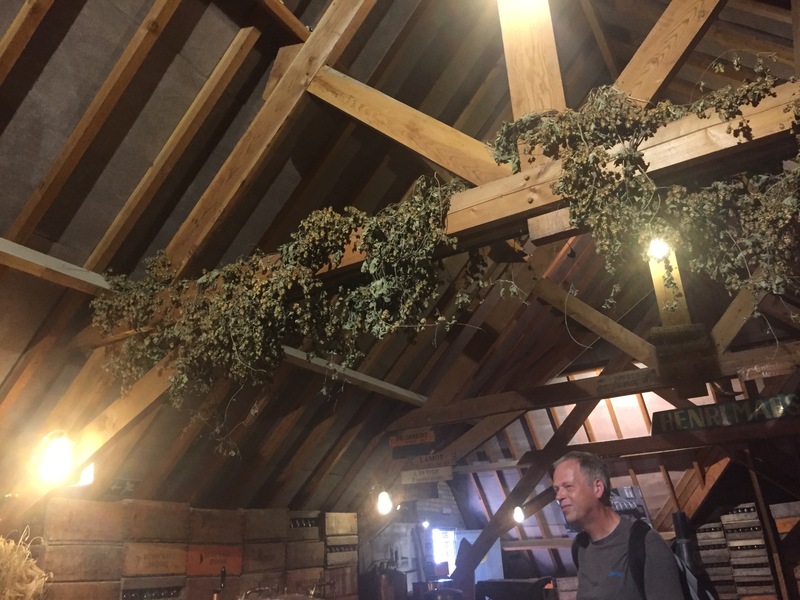 She showed us drying hops used in their beer and told us hops and cannabis had similar effects on people and that was why Belgium people were so “hoppy.” Belgium beer has a much higher alcoholic content-most is six to eleven percent alcohol- than American beer. Her opinion is that drinking any beer less than six percent alcohol is for sissies. 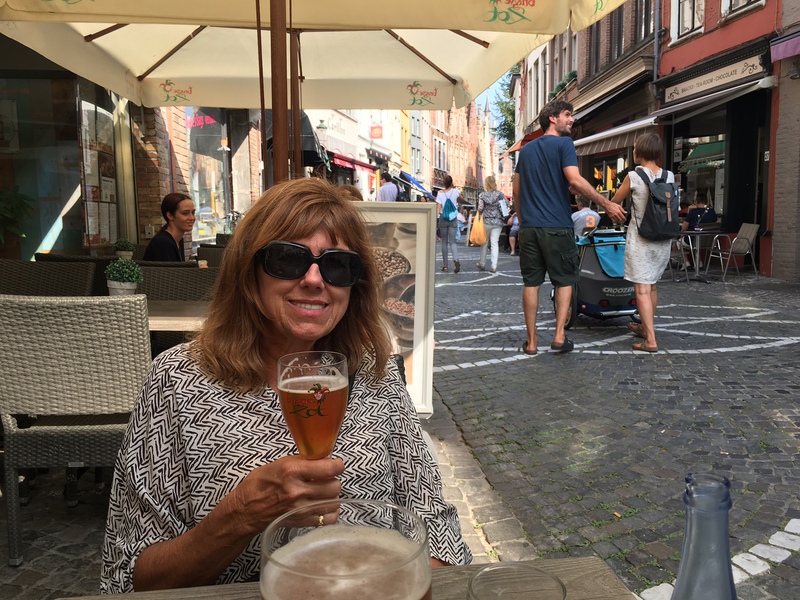 She warned us that tourists aren’t prepared for Belgium beer and to be prepared for it “sneaking up on you.” We think she probably had had a few beers before our tour. 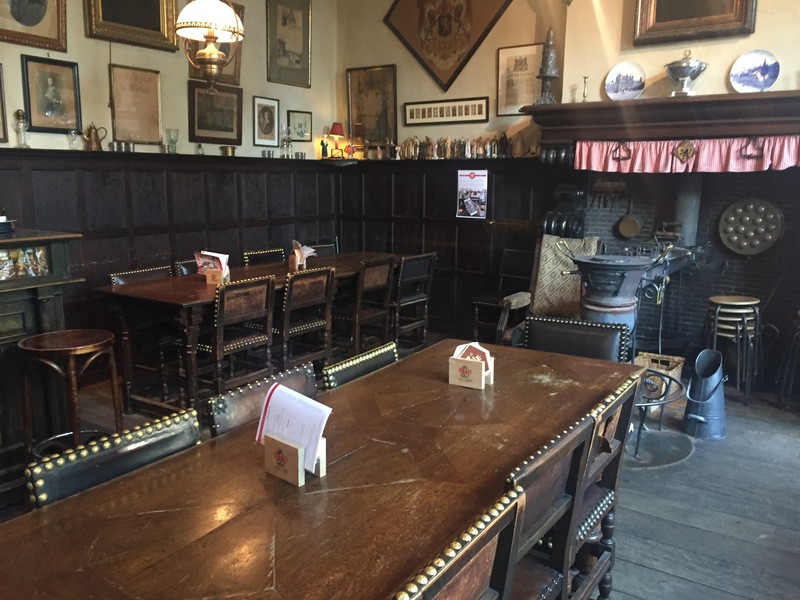 We ate lunch/dinner at Vlissinghe, a pub dating from 1515. It was such a beautiful day that we sat in their back garden and, of course, had more beer. 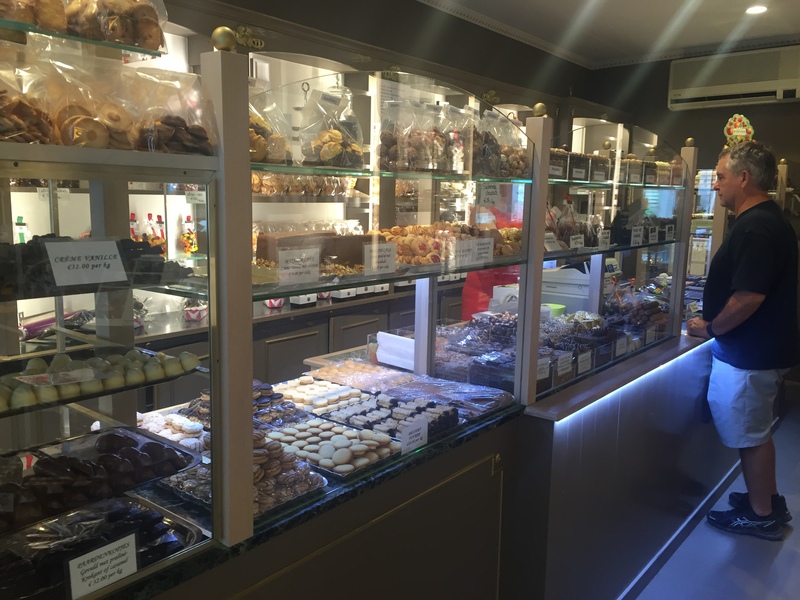 Belgium is know for fine chocolate, and chocolate shops are everywhere in Bruges. 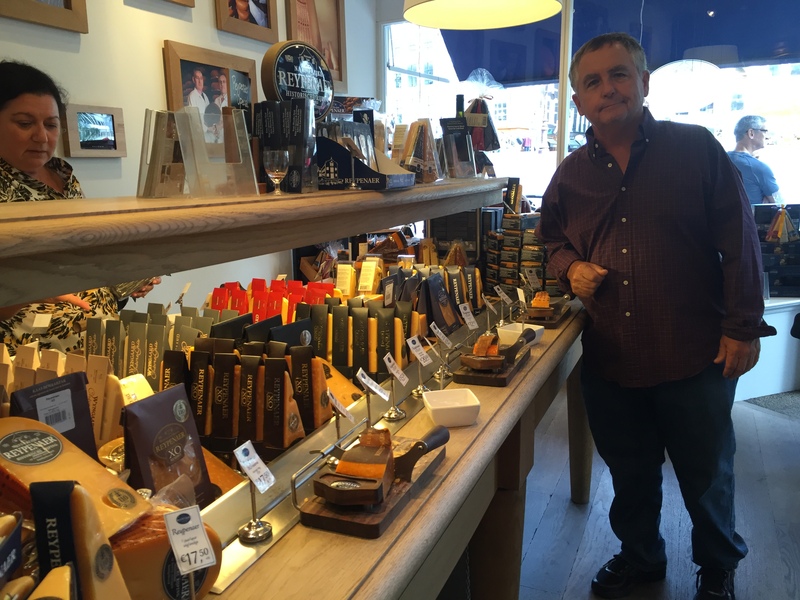 We asked our apartment host, Michael, where to go for the best chocolate. 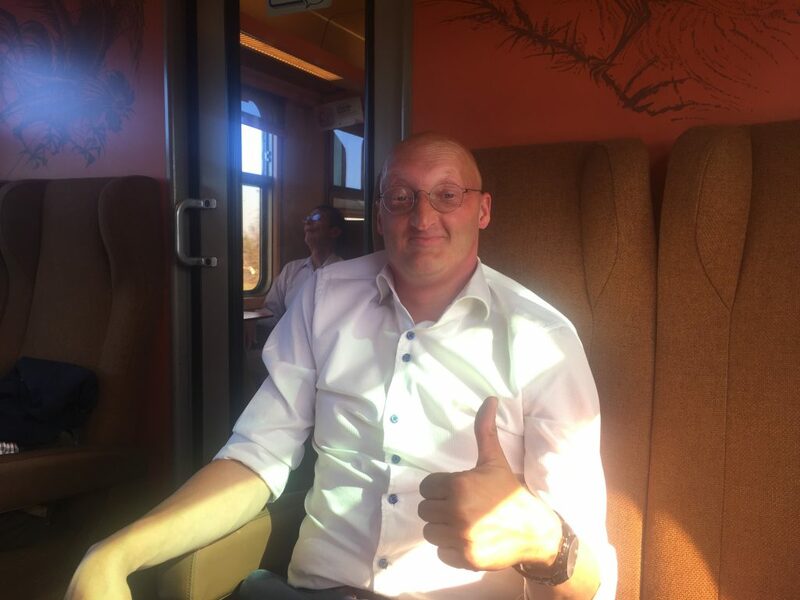 His recommendation was Spegelaere. All of their chocolates are handmade at the shop, and they are always one of the three chocolate makers asked to represent Belgium at world expositions. It was so hard to choose. 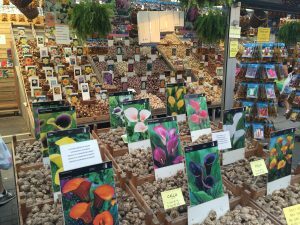 The woman helping us advised us to tell her what we liked and she would make recommendations. The cream-filled chocolates were different shapes depending on the filling. 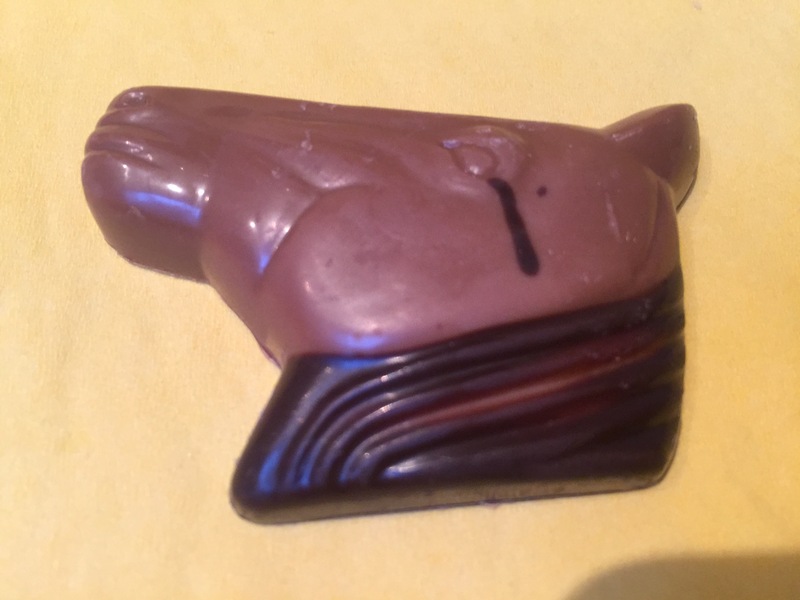 This yummy caramel-filled horse was shedding a dark-chocolate tear. This entry was posted in Amsterdam, Bruges, Paris 2016 on September 14, 2016 by debbie. More than twenty years ago Paul became fascinated with Van Gogh when he first saw his work at the Musee d’Orsay in Paris. 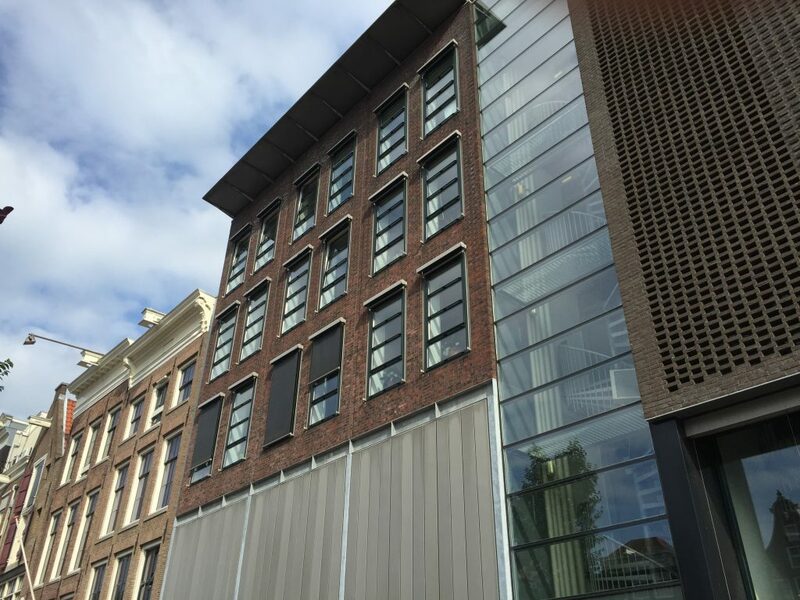 Ever since, the Van Gogh Museum in Amsterdam has been on his list of must-see places. It took awhile, but today we got to the Van Gogh Museum, home of the world’s largest collection of Van Gogh art. The museum is beautiful and extensive. After a couple of hours, we took a break and had a yummy pastry in the coffee shop (a real coffee shop.) 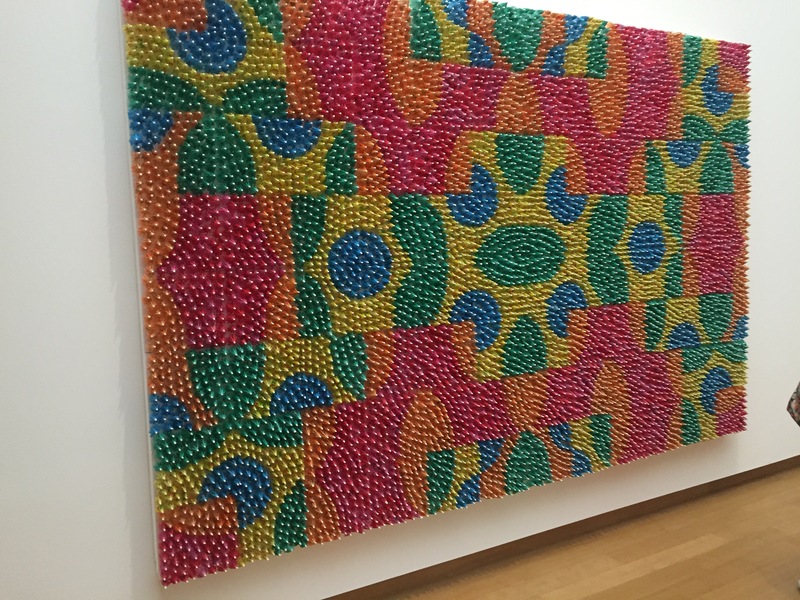 A little sugar and a little rest and we were ready to see the rest of this fabulous museum. 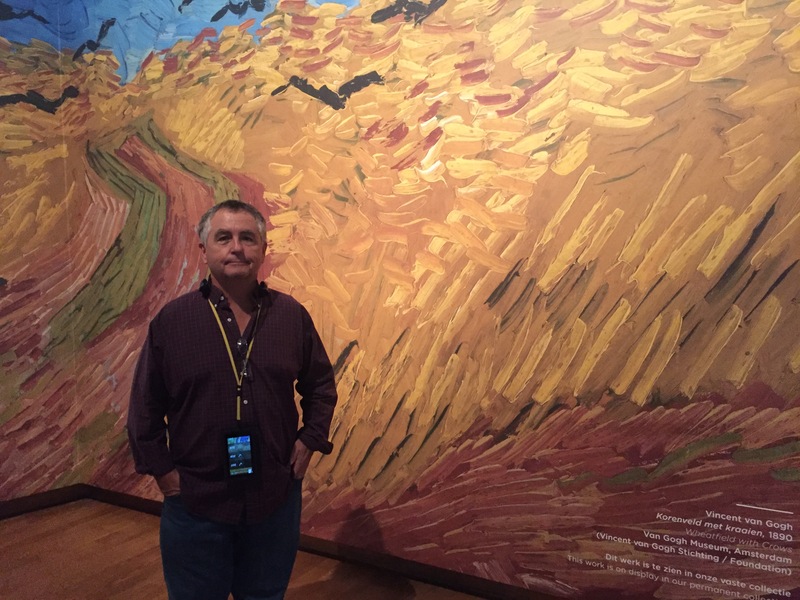 We were so lucky to be able to see the special exhibit, On the Verge of Insanity, which focused on the last eighteen months of Van Gogh’s life. Using letters, art, timelines and narration, the exhibit addressed questions about Van Gogh’s mental health such as why he cut off his ear, why did he commit suicide, and what illness did he have. 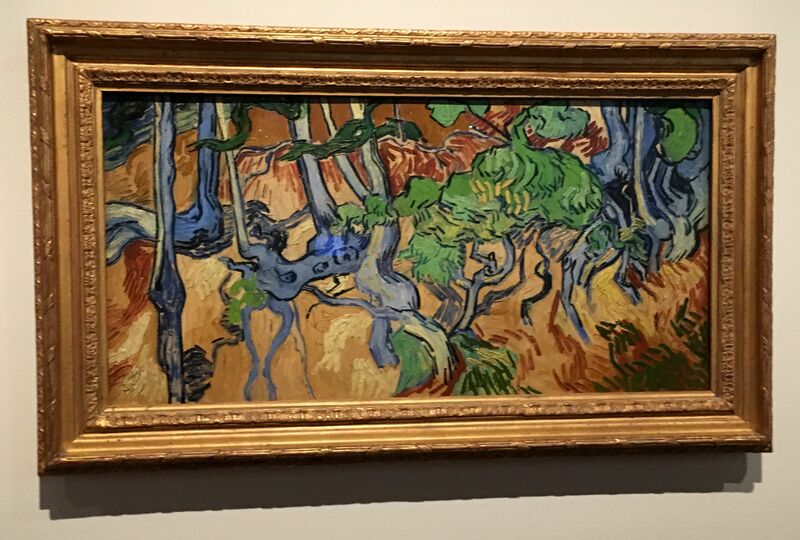 Van Gogh’s last painting, which was unfinished, was at the end of the exhibit. 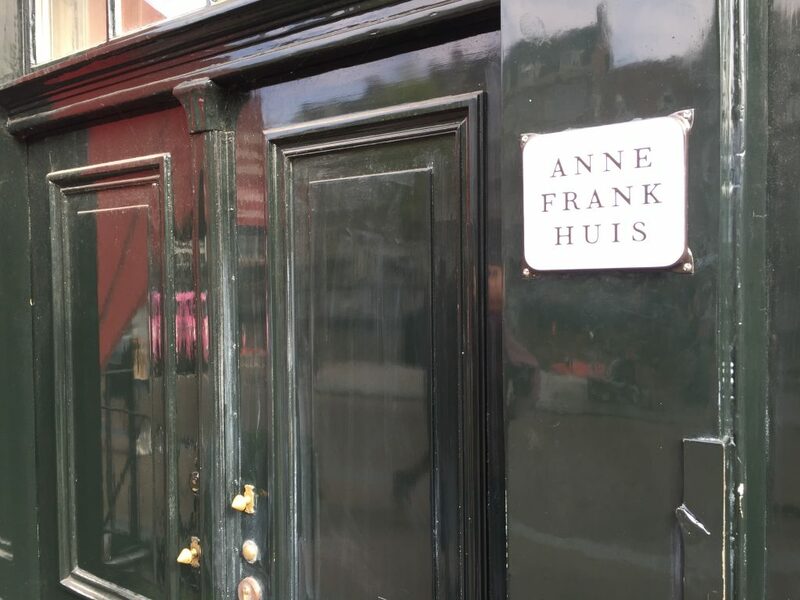 After lunch we went to the Anne Frank House. Because the line to get in is so long without advanced tickets, we wanted to get tickets ahead of our trip. Their web site is a little unpredictable, and every time we tried to get tickets, they were sold out. 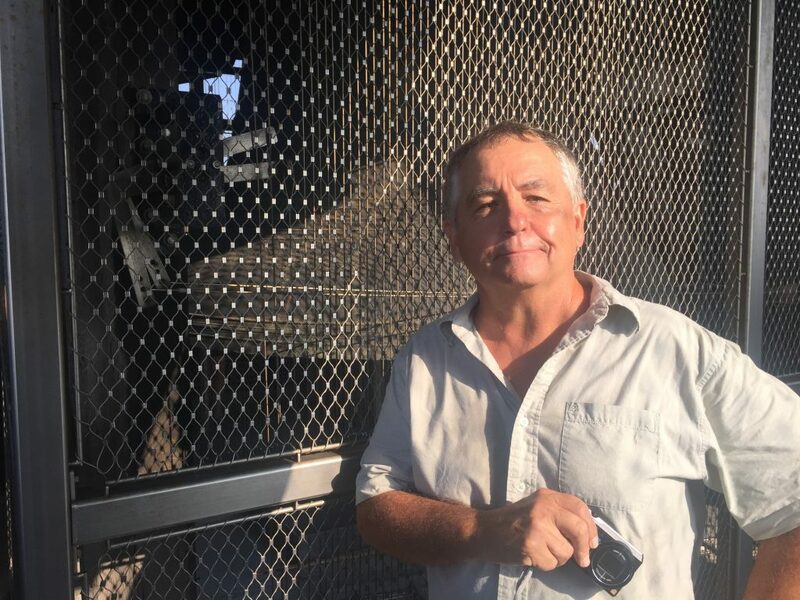 After doing a number of trial runs, Paul was pretty sure he had figured out their system and got up at 2:00AM one morning and was able to get us tickets. I read The Diary of a Young Girl by Anne Frank when I was young and still remember how hard it was to understand what happened to her. Going in to the rooms where she and her family hid, seeing pictures of how the rooms looked when she lived there, watching interviews with her father and others who knew her and reading quotes from her diary created a powerful and emotional experience. 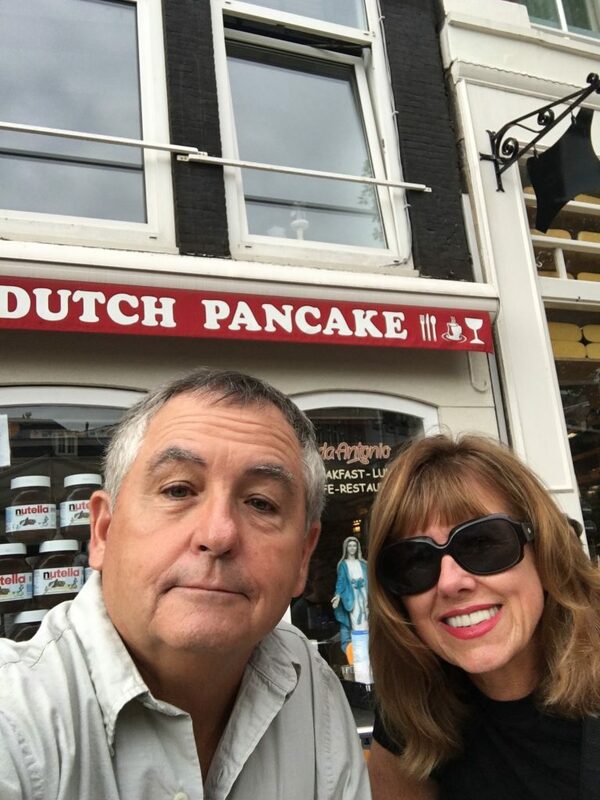 Paul had a very Amsterdam experience today-a bicycle ran into him. Paul and the cyclist went down, but luckily no one was hurt. 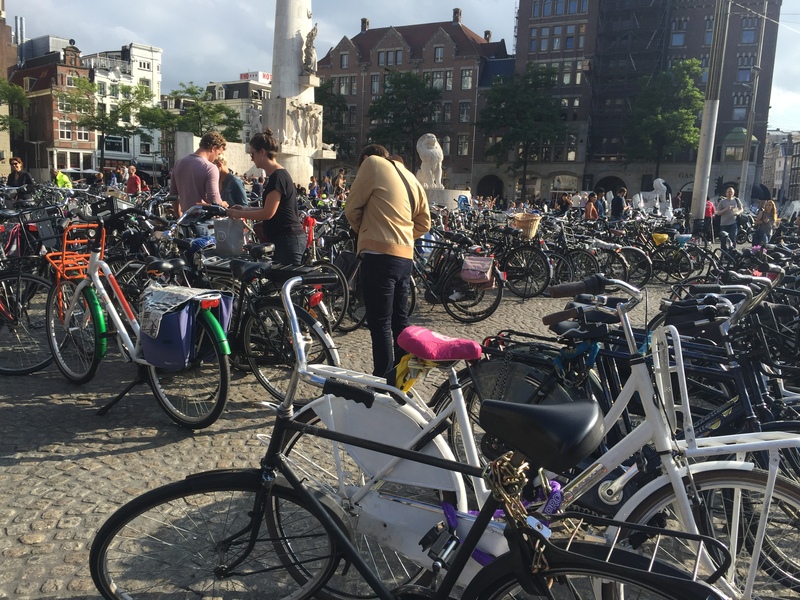 Bikes are everywhere here, and we have really worked at being aware of them. I love seeing women in dresses and heels and men in suits biking to work. Children usually sit in little metal seats in the front, and no one wears a helmet. 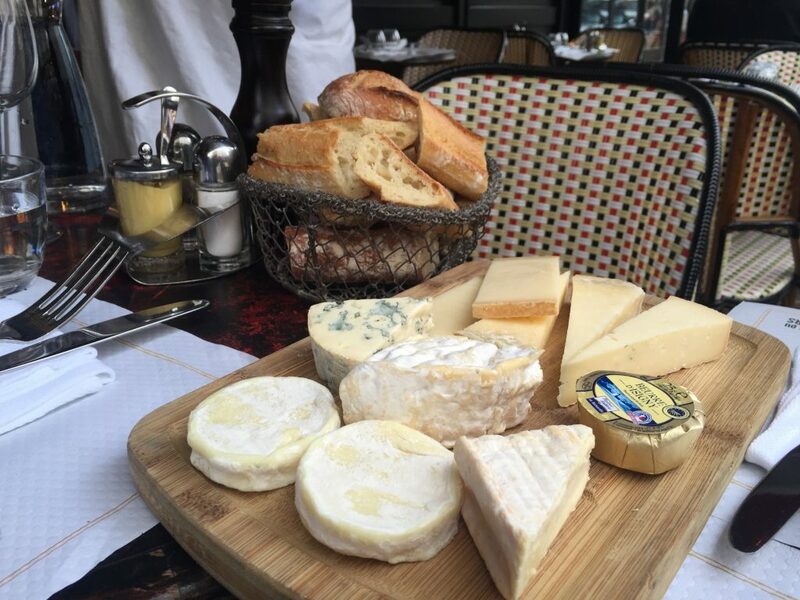 We walked by a cheese store that was hosting a cheese tasting. 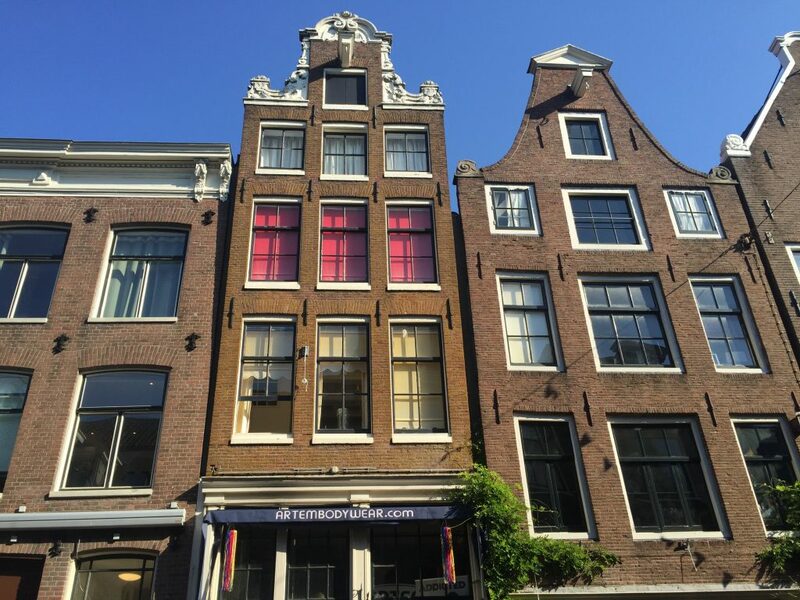 We went to the Red Light District and saw women in windows. 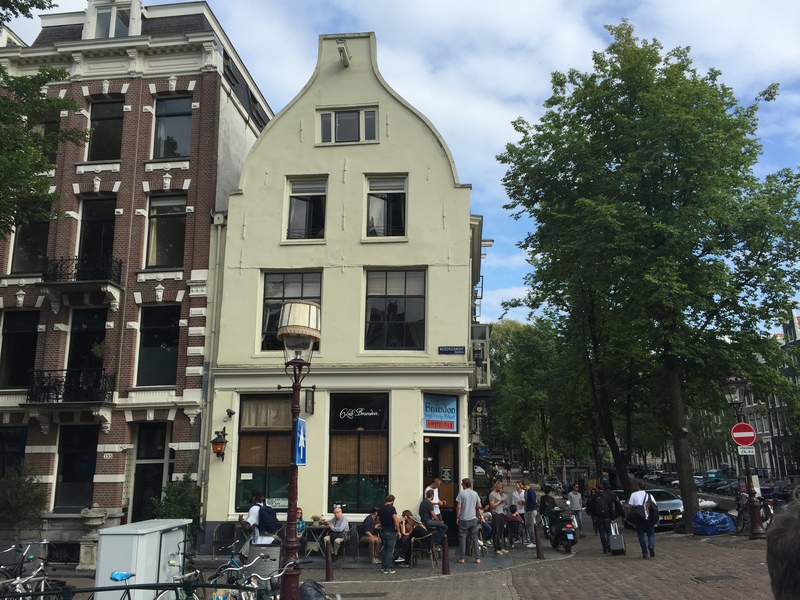 There seemed to be more coffee shops (the marijuana kind) in this part of town, and people were sitting outside smoking marijuana. 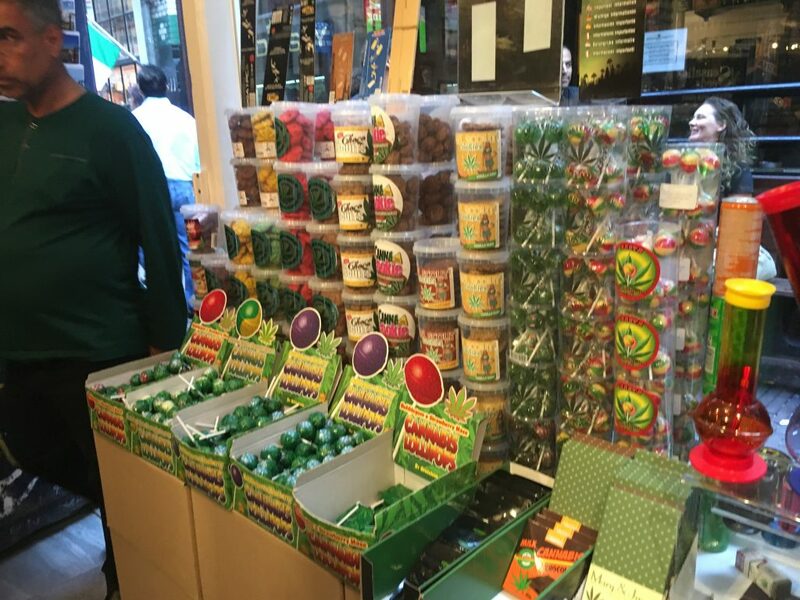 Some of the shops sold marijuana candy, cookies and tea. On the way back to our apartment we found a great outside table on Rembrandt Square and ended our day with a light meal and some great people watching. 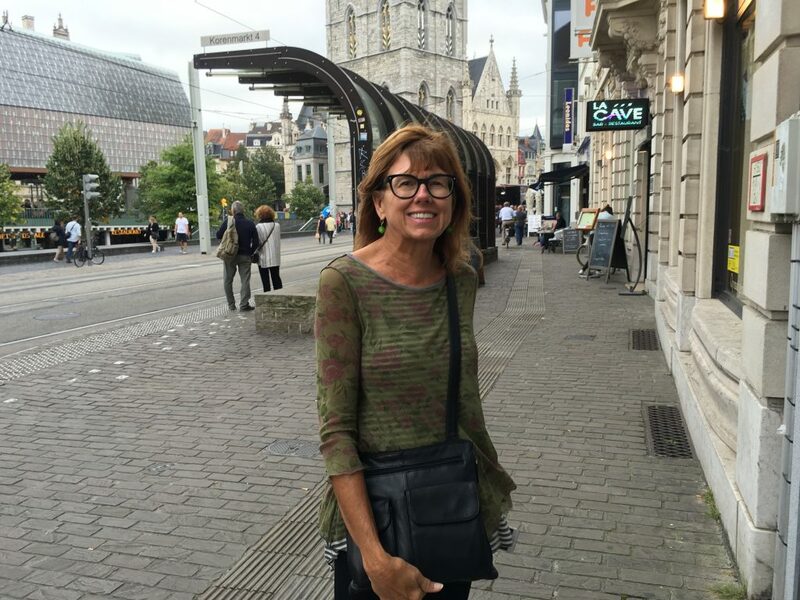 This entry was posted in Amsterdam, Bruges, Paris 2016 on September 11, 2016 by debbie. 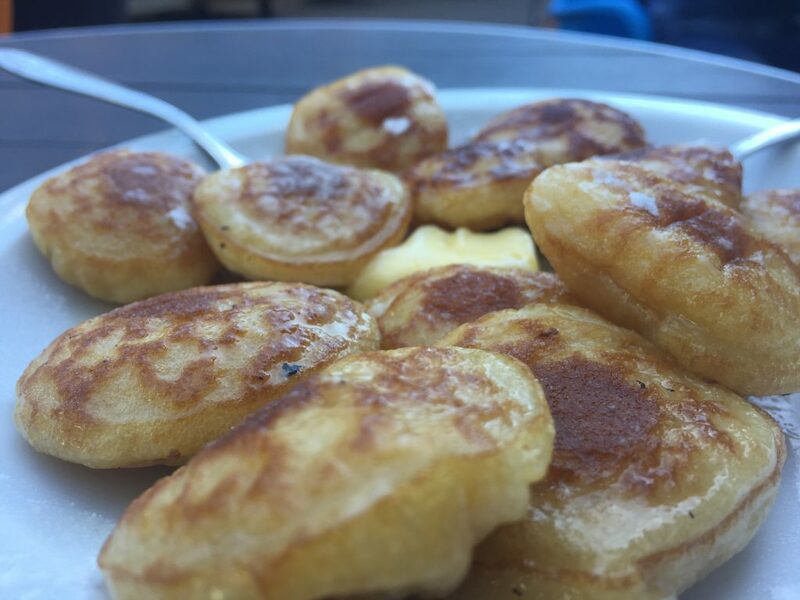 I was in breakfast heaven this morning, sitting outside enjoying a plate of poffertjes. Sometimes called Dutch doughnut holes, they are little baby pancake balls smothered in butter and powdered sugar. After breakfast we strolled through the lovely Jordaan district, reputedly the most famous neighborhood in the Netherlands. Developed in the seventeenth century, it is a maze of little streets, art galleries, restaurants and specialty shops. We visited the Stedelijk Museum whose collection includes examples of every significant movement in art and design in the 20th and 21th centuries. 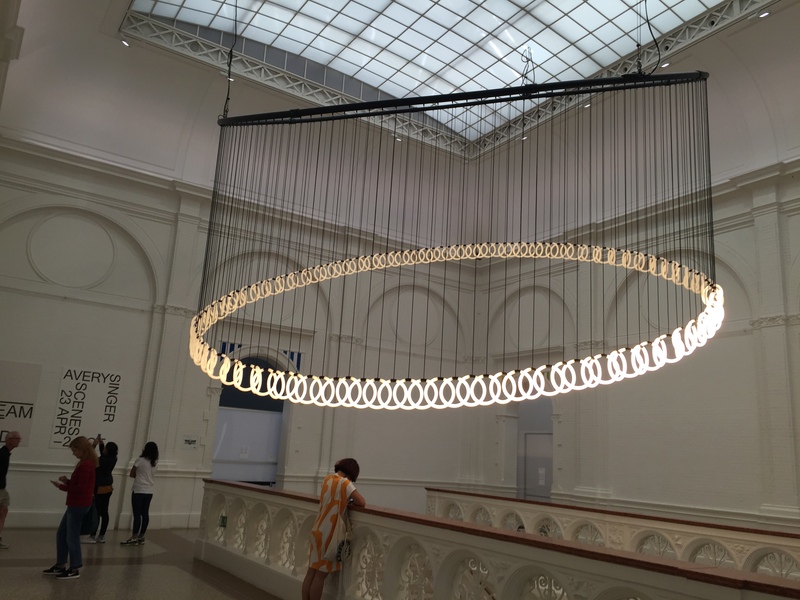 Dream Out Loud, a special exhibit showcasing twenty-six designers trying to solve complex social problems, was a special treat. 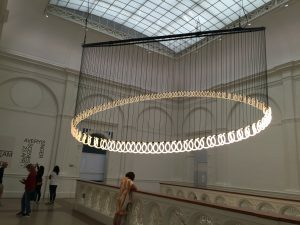 We saw a huge design made from cocktail umbrellas and a neon chandelier that turned at the same speed as the earth. 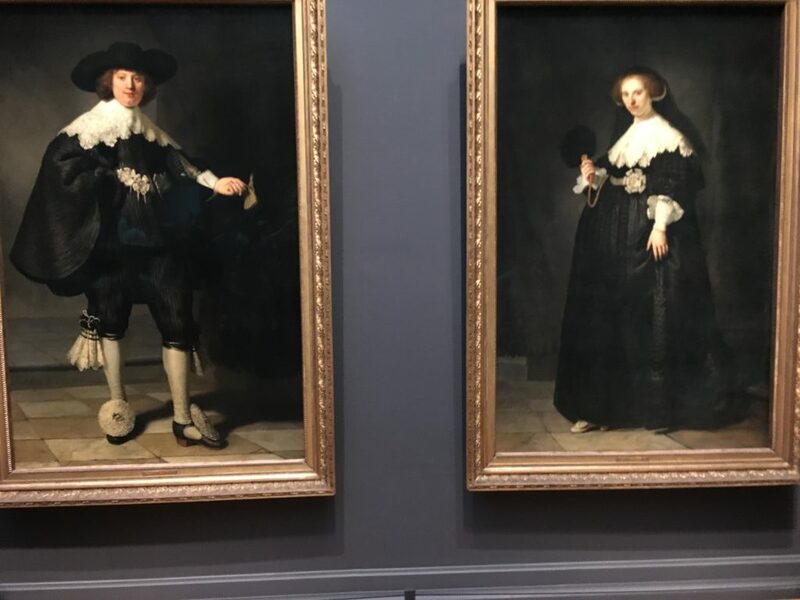 The museum was amazing, but I would not recommend lunching there. 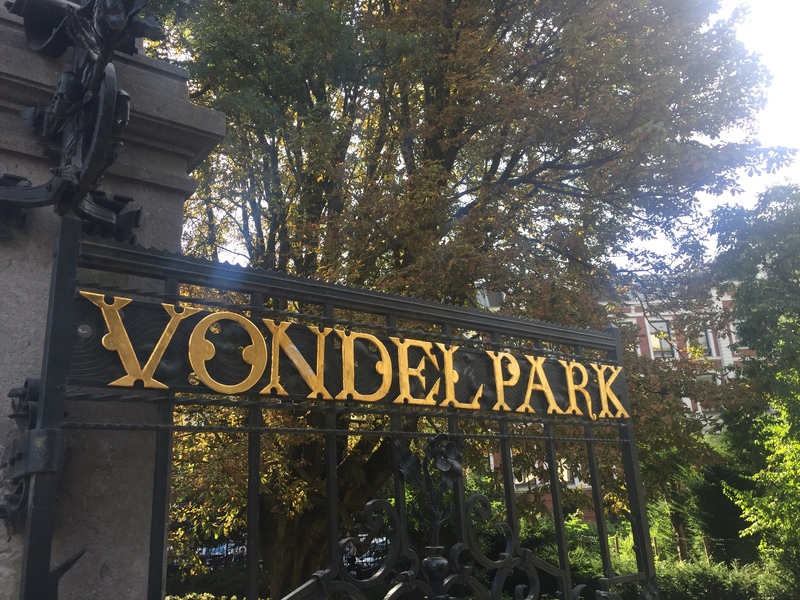 Vondelpark was on our itinerary today, and we thought we were there and weren’t too impressed. When we got home and checked our map, we realized we hadn’t gone far enough, so we missed it. The park we thought was Vondelpark didn’t even have a name on the map. We’ll try again another day. While exploring the Jordaan district, we walked by Mantoe, the Afghani restaurant Farid, our taxi, driver had recommended. The universe was definitely telling us to try this place. Luckily, we were able to get reservations. We weren’t disappointed. 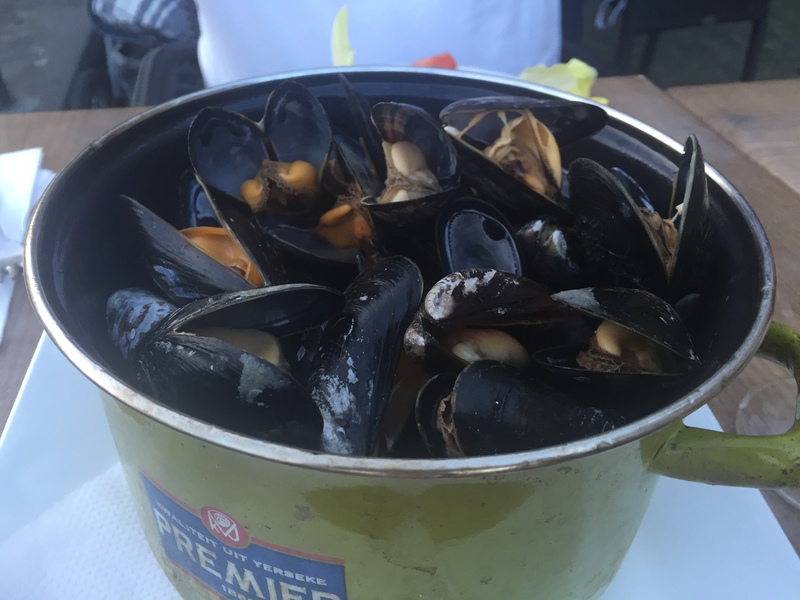 Our five-course meal was one of the best ever. 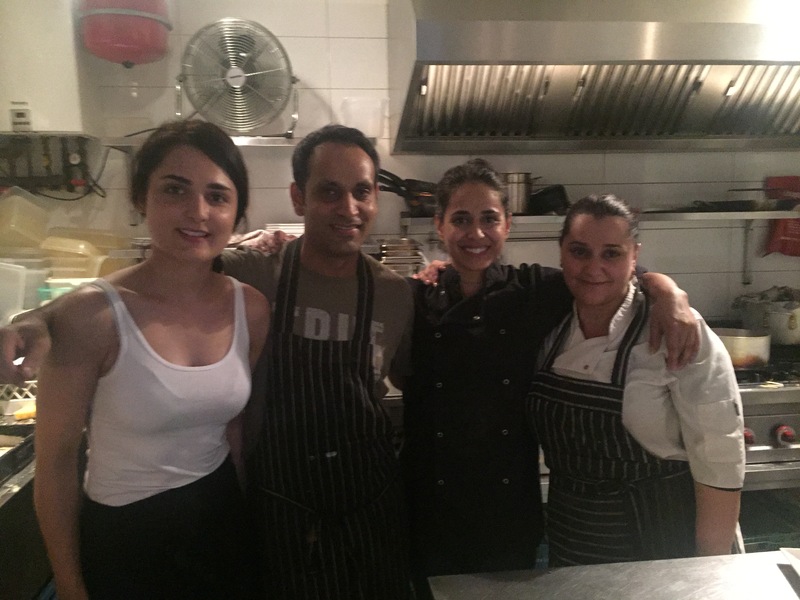 Mantoe’s is owned by an Afghani family and is the first Afghani restaurant in the Netherlands. Our waitress told us that it is part of her culture to offer guests a feast. 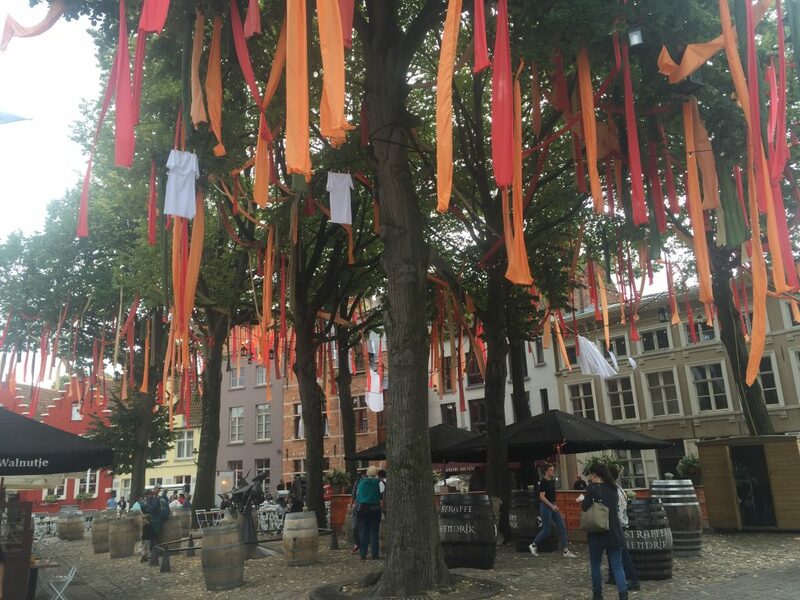 This entry was posted in Amsterdam, Bruges, Paris 2016 on September 10, 2016 by debbie. 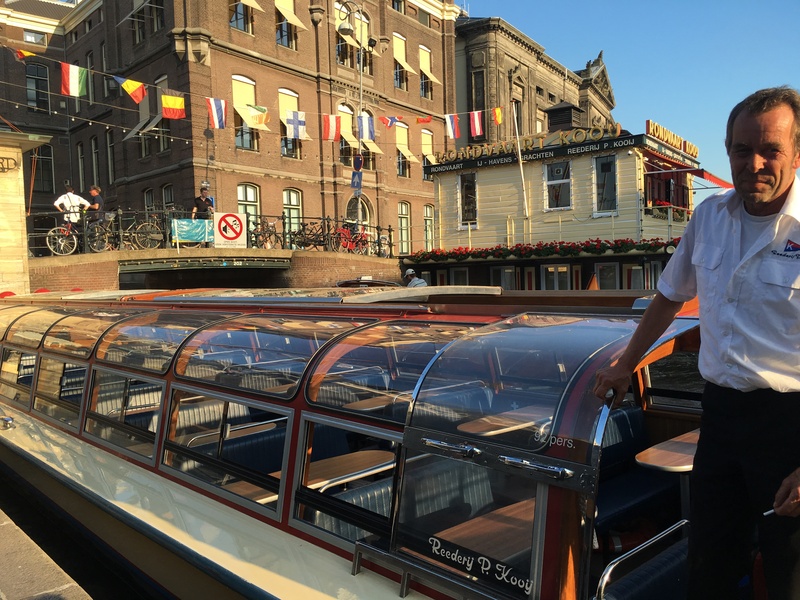 A warm, sunny morning welcomed us when we arrived in Amsterdam today. Driving to our apartment, our Afghani taxi driver, Farid, talked with us about life in Afghanistan and his family’s experience moving to Amsterdam. He said Kabul is safe, but the outer areas experience daily bombings and both the Taliban and ISIS are gaining ground and adamantly stated that they are not Muslims. 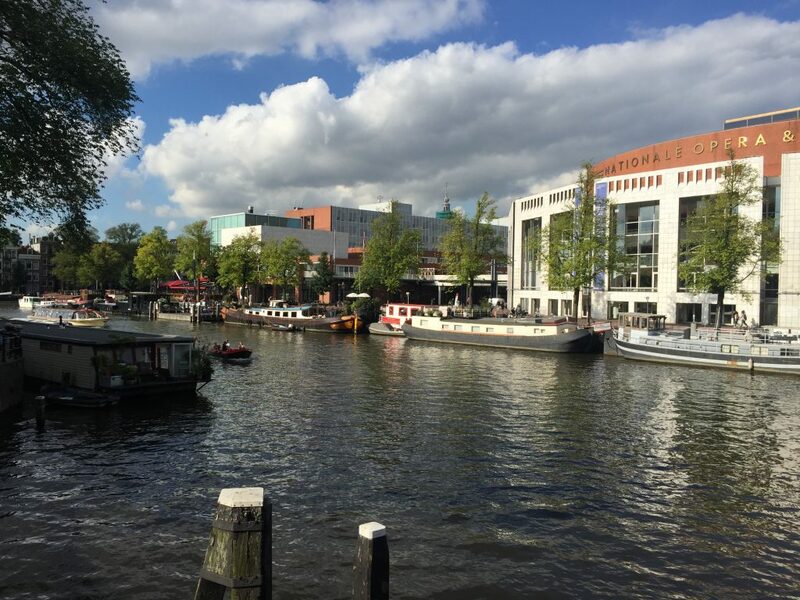 Farid told us he chose to live outside Amsterdam because he did not want his three children being close to the coffee shops, which sale marijuana, not coffee in Amsterdam. Coffee ship patrons must be eighteen, and I had that it was mostly tourists who patronized the coffee shops; local people were not very interested. 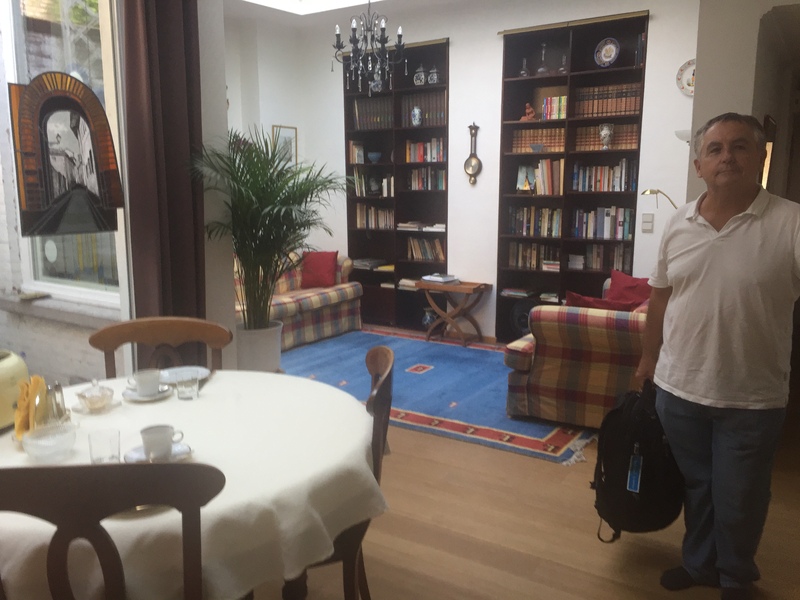 Our host, Edwin, met us outside our second-floor apartment in a seventeenth-century building. 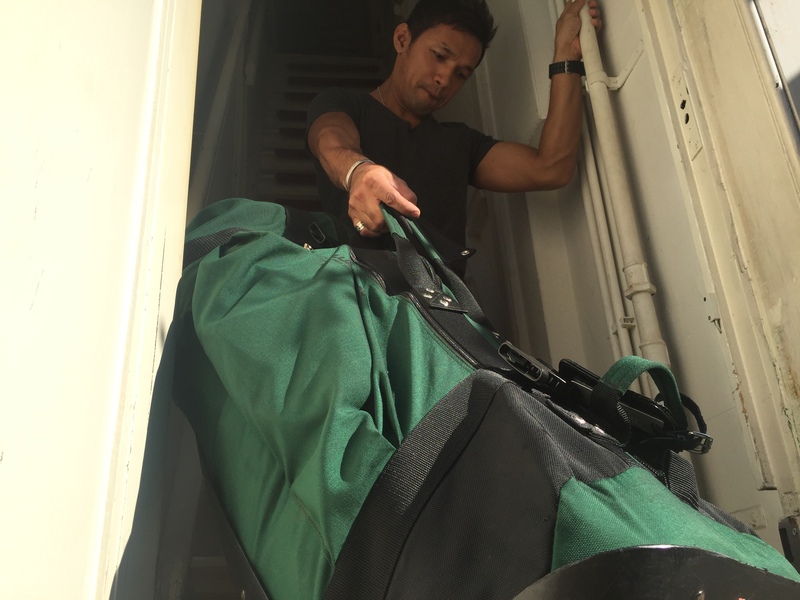 Thank goodness he was there to help get our luggage up the incredibly steep “Dutch stairs”. They look more like a ladder than stairs. 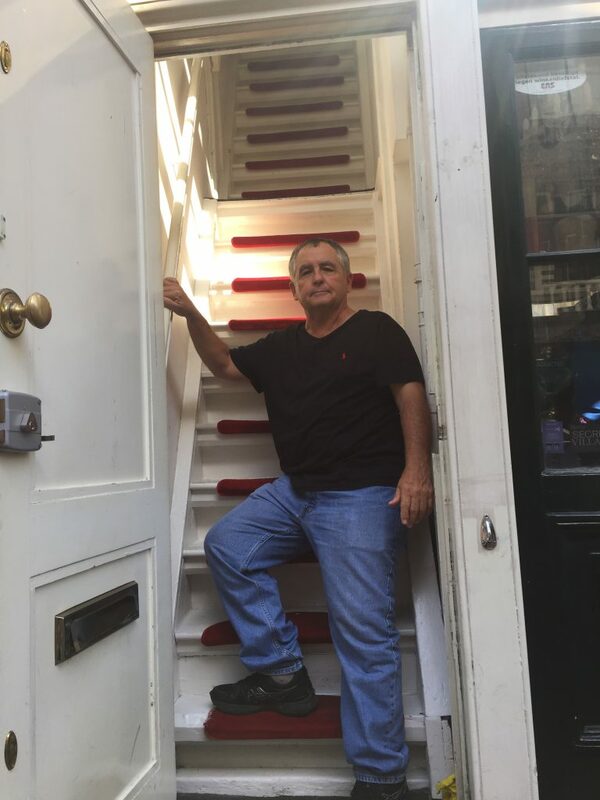 Because houses used to be taxed based on their width, older Dutch houses are very narrow and tall; they have nice size rooms but not much space for stairs. Edwin assured us that in a few days we would be so accustomed to the steep stairs that we would go up and down without giving it a thought. Right now we are holding on to both railings and stepping slowly both up and down . 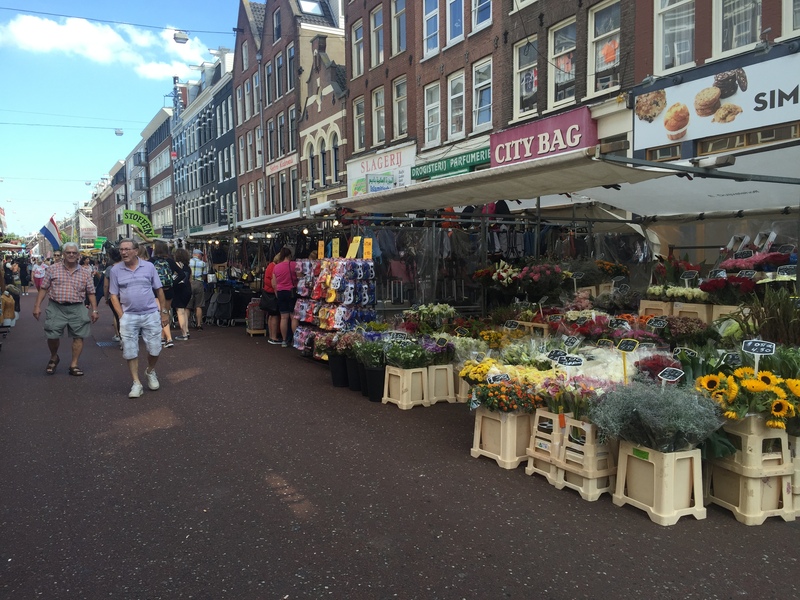 Our apartment is a block from the flower market. 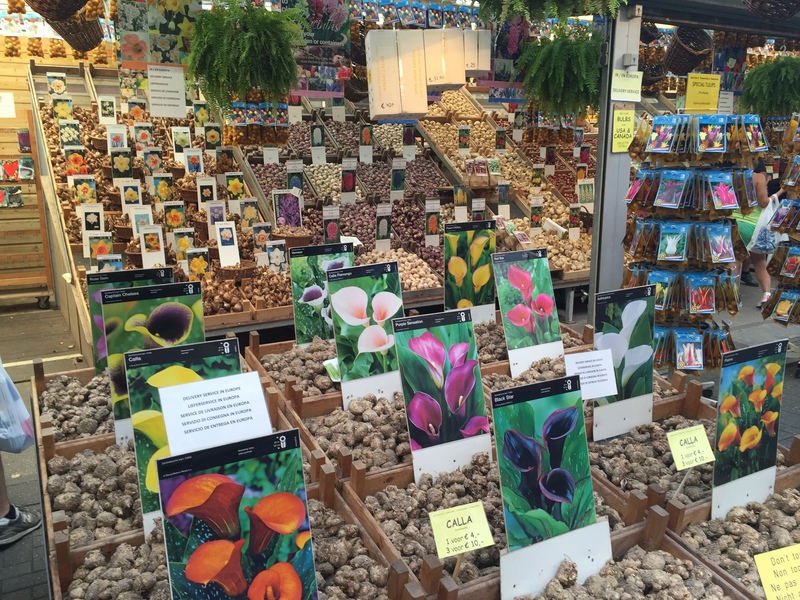 Stall after stall sell bulbs and flowers. 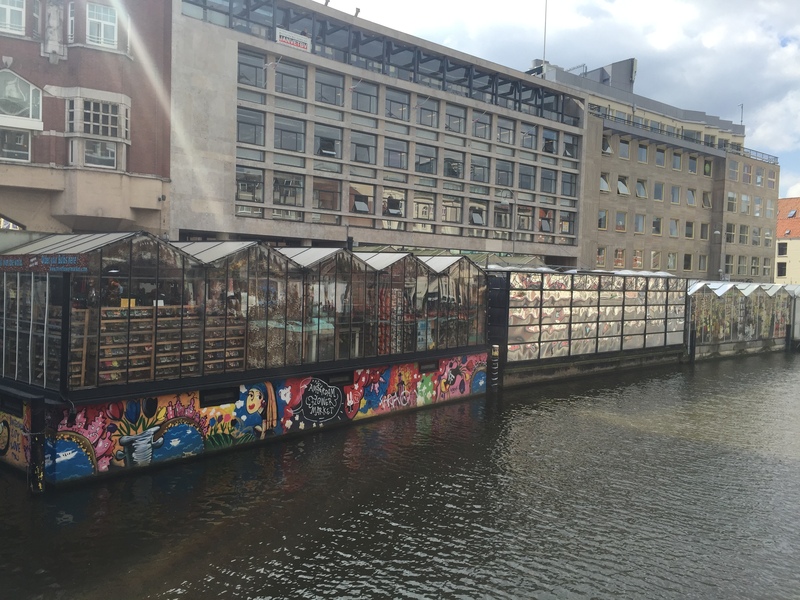 We didn’t realize until we walked past the flower market that the stalls are built over the canal. 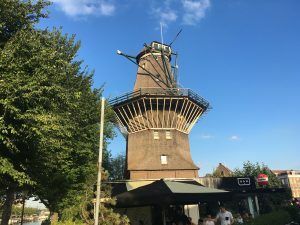 Edwin recommended that we visit the Brouwerij”T IJ brewery located next to the De Gooyer windmill, the only remaining windmill in Amsterdam. 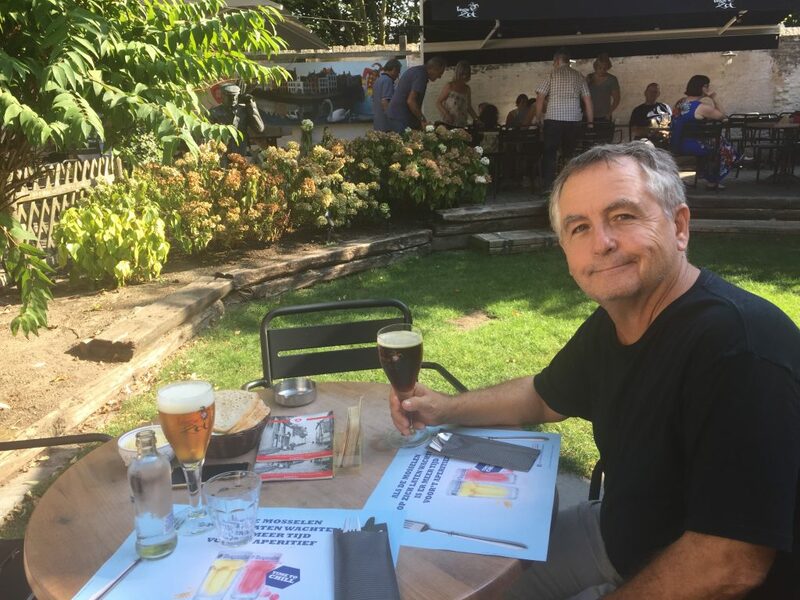 Thanks to his great recommendation we enjoyed a sampling flight of their five original beers and met a lovely couple from Cleveland who gave us a great Paris restaurant recommendation. 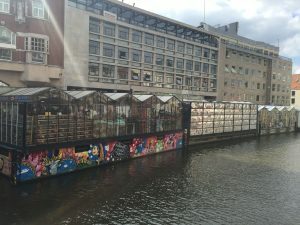 Along the walk to the brewery we passed many of the more than 3,000 houseboats on the Amsterdam canals. Some of them are available to rent. Prior to 2008 very few of the houseboats were connected to the sewer system. Now, more than 2,000 boats have connected to the system, and the goal is to have all boats connected by 2017. After a wonderful Indian dinner at Indian Shiva, it’s early to bed for us. 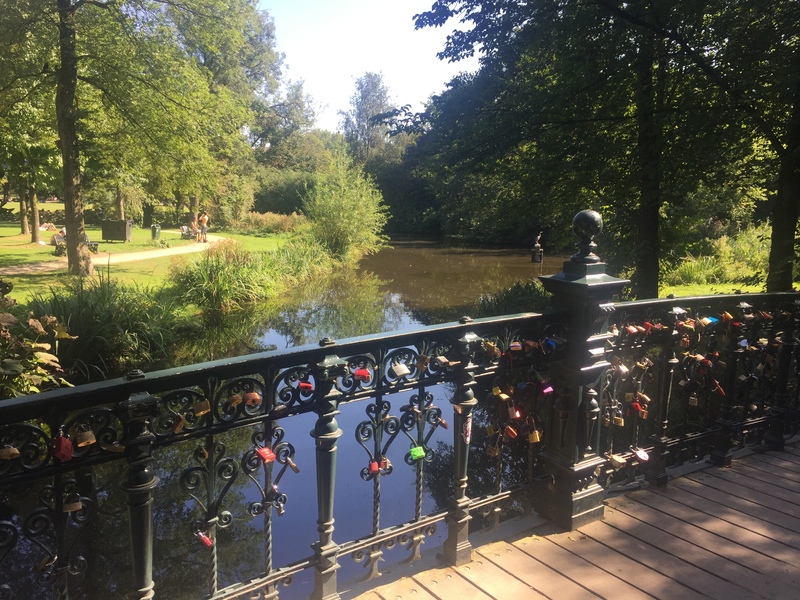 This entry was posted in Amsterdam, Bruges, Paris 2016 on September 9, 2016 by debbie.